Little Princess Crown Triangle Decoration Kit INCLUDES 27 triangle banner segments, 18 pennant die cuts, and 27 small triangle cut outs – this variety of triangle-shaped Little Princess Crown DIY decorations will easily help you bring all your party ideas to life. The pink and gold princess party theme is great for a baby shower or birthday party. 5-Piece Photo Booth Frame and Props Kit INCLUDES 1 Custom Little Princess Crown photo booth picture frame prop, 2 round photo booth props and 2 rectangle photo booth props – Great for a baby shower or birthday party. Take entertaining and shareable party photos of your friends and family while making memories with funny pink and gold princess photo booth props! PERFECT FOR ANY CROWD! 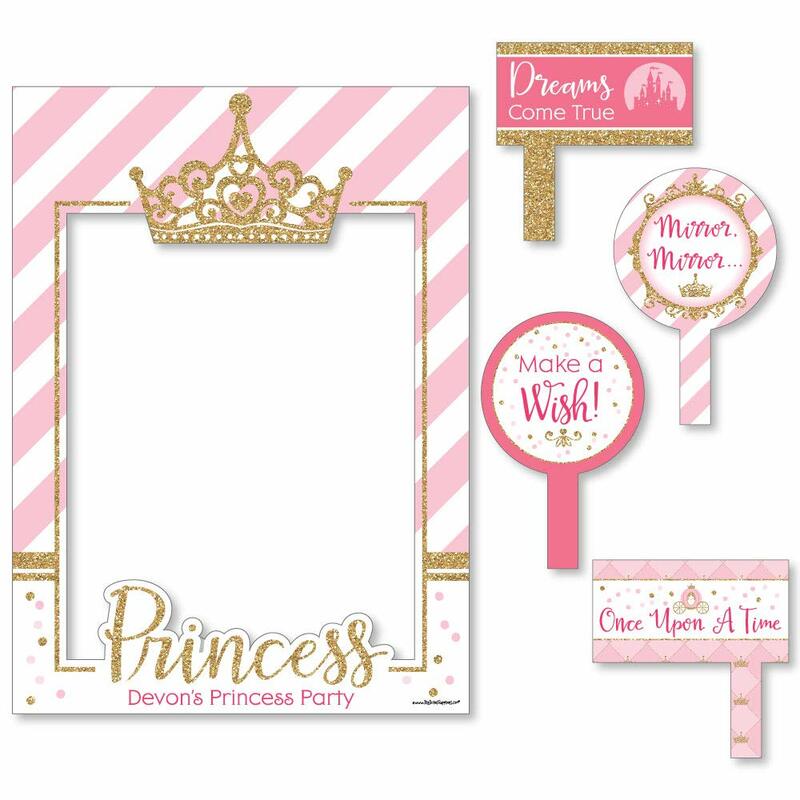 Personalized Photo booth props are fun Little Princess party supplies for adults and kids – everyone will love posing with cute pink and gold photo booth props. Simply click “customize now” to add your personalized text to these fun Little Princess Crown favor boxes. Custom Photo Frame Props Kit MEASURES 17 inches x 23 inches (Picture Frame), 6 inches x 9.5 inches, including the handle (2 Round Props) and 7 inches x 7 inches, including the handle (2 Rectangle Props). Little Princess Crown Shaped Cut Outs INCLUDES 24 pink and gold princess shape cut outs – Great for bringing all your DIY baby shower or birthday party ideas to life! DIY PARTY SUPPLIES: Little Princess Crown shaped cut outs include 24 paper die cuts in three different princess shapes that coordinate with the Little Princess Crown party theme. Set of 24 princess shapes SIZE 8 castle paper die cuts (3” X 3”), 8 tiara paper die cuts (3″ x 2.5″), 8 carriage paper die cuts (3″ x 2.5″). The unique design makes these little princess party decorations a fun addition to any baby shower or birthday party. Little Princess Crown Favor Boxes INCLUDES 12 pink and gold princess party favor bags, 12 gift tags and coordinating satin ribbon. Classic favor boxes are a party must-have. 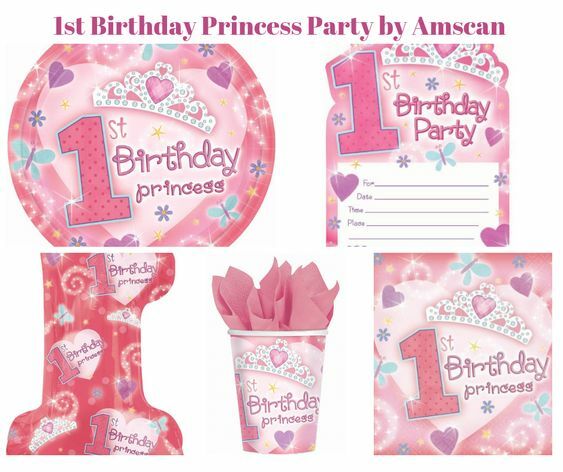 Pink and gold princess theme party supplies are great for a baby shower or birthday party. Little Princess Crown Party Favor Boxes SIZE 4.75 inches wide x 4.75 inches high x 2.25 inches deep (fillable inside space) with a total height of 7 inches, including the handle. The coordinating gift tags and ribbon makes these 12 pink castle party favor boxes a complete treat bag party kit that everyone will love. PARTY SUPPLIES: Baby shower or birthday party favor boxes will hold a variety of treats, prizes and party favors for your guests. 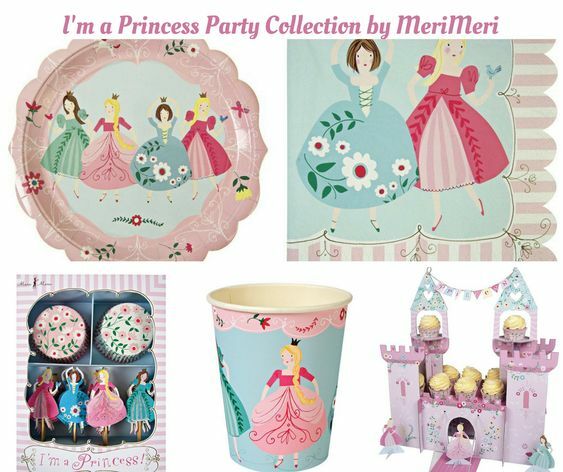 Fill them with baked goodies, party trinkets or thank you gifts for adorable princess party favors! 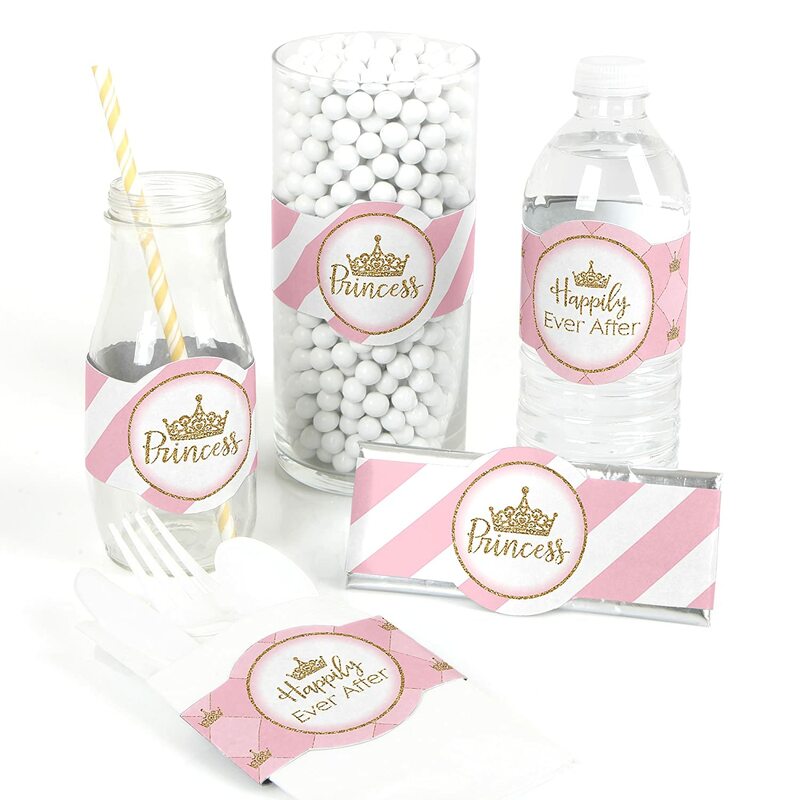 PREMIUM PARTY FAVOR BOXES: Little Princess Crown party favor boxes are professionally printed on heavy-duty cardstock paper with a photo-like shine. They are hand-folded and individually inspected, then carefully packaged. Favor boxes will arrive flat, partially assembled. Finishing assembly is required but it is easy. Once assembled, add the princess tiara gift tag with the included ribbon for perfect party favors! 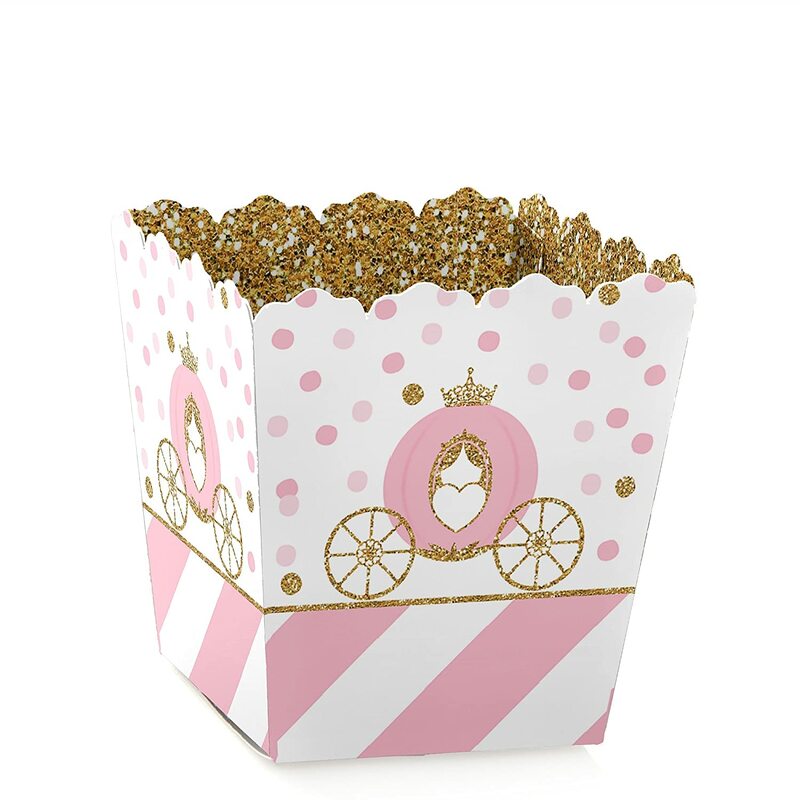 Little Princess Crown Favor Popcorn Treat Boxes INCLUDES 12 Pink and Gold Princess party favor boxes. Little Princess Crown treat boxes are perfect for any event. The princess tea theme is great for a baby shower or birthday party. Little Princess Crown party favor popcorn treat boxes SIZE 5.75 inches tall x 3.5 inches square at the top. 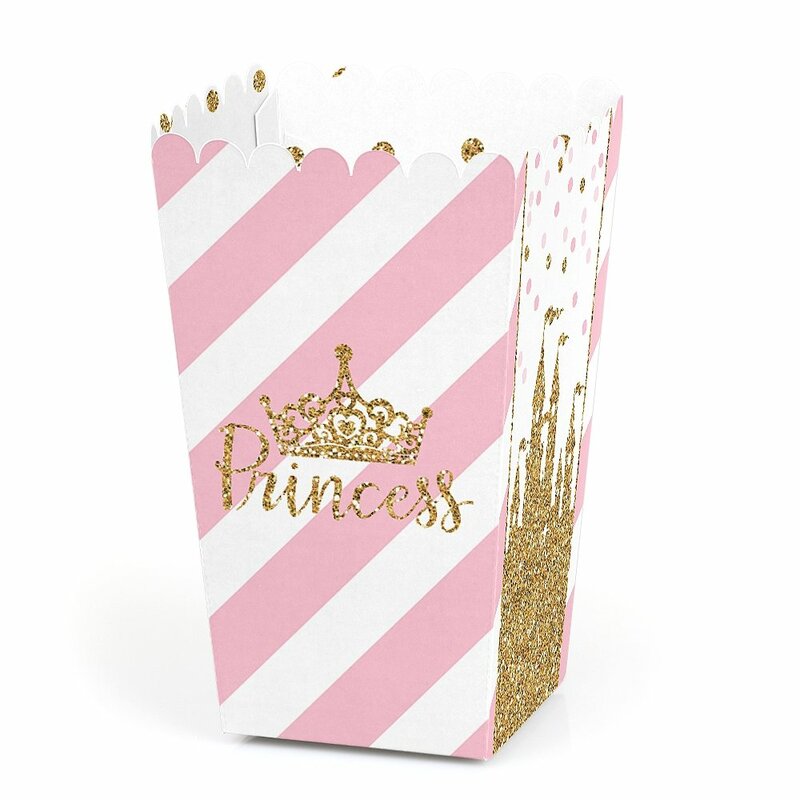 The unique design and large size makes these 12 girls princess popcorn boxes a must-have for any baby shower or birthday party. POPCORN BOX PARTY SUPPLIES: Little Princess Crown popcorn boxes will hold a variety of party food. Fill them with sweet treats or salty snacks. Popcorn, caramel corn, candies and other goodies will look amazing on your candy buffet with these princess castle favor boxes. 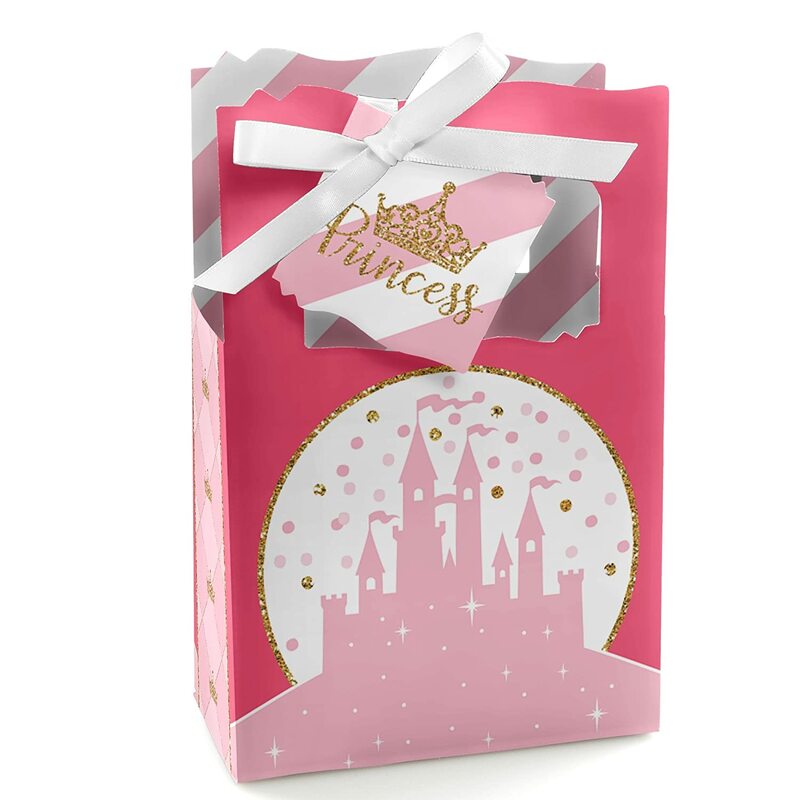 PREMIUM PARTY FAVOR BOXES: Little Princess Crown party treat boxes are professionally printed on heavy-duty cardstock paper with a photo-like shine. They are hand-folded and individually inspected, then carefully packaged. Popcorn boxes will arrive flat. Easy assembly is required. Little Princess Crown Candy Boxes INCLUDES 12 Little Princess Crown baby shower favor boxes. Little Princess Crown candy treat boxes are perfect for any event. 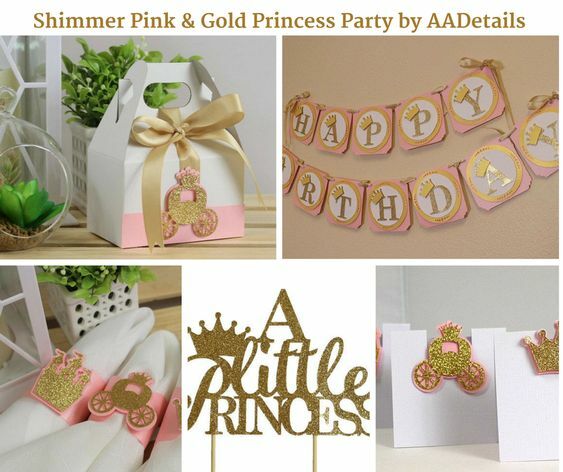 The pink and gold princess theme is great for a baby shower or birthday party. Little Princess Crown party favor candy boxes SIZE 2.75 inches tall x 3 inches square at the top. The unique design makes these 12 pink and gold princess favor boxes a must-have for any children’s birthday party. CANDY BOX PARTY SUPPLIES: Little Princess Crown candy boxes will hold a variety of party food. Fill them with sweet treats or salty snacks. Candies and other goodies will look amazing on your candy buffet with these princess favor boxes. 172-Piece Little Princess Crown Party Decorations Favor Kit INCLUDES 20 mini candy bar wrappers, 24 circle stickers labels, 20 round tags, and 108 round candy labels – perfect for styling an adorable baby shower or birthday party. Unique Little Princess Crown party favors are easy with this fun DIY party kit. VARIETY OF STYLES & SIZES! Princess Baby Shower or Birthday Party Favor Kit includes stickers and tags to help you create numerous party favors. Mini Candy Bars (20 wrappers, 1 3/8 inches wide x 2 5/8 inches high, fits Hershey miniature candy bars); Circle Sticker Labels (24 stickers, 1 2/3 inches diameter) 20 Round Tags (2 ½ inches diameter, die cut & ready to use), and Round Candy Labels (108 small round stickers, .75 inches diameter, fits Hershey Kisses or other small, round candy). 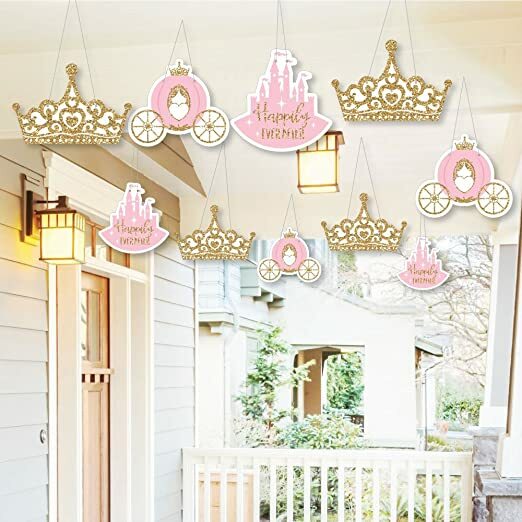 Little Princess Crown Hanging Decorations INCLUDES 6 Pink and Gold Princess ceiling decorations. Little Princess Crown hanging decor is perfect for any event and will easily hang from all ceilings. 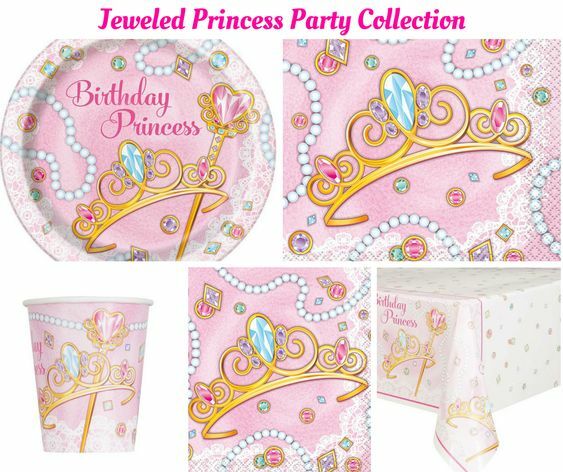 The princess tiara party theme is great for a baby shower or birthday party. Little Princess Crown Party Hanging Decorations SIZE 20 inches long x 4.5 inches square at the decorative base. The unique design and large size makes this set of 6 royal princess ceiling decorations a must-have for any baby shower or birthday party. Little Princess Crown Standard Candy Bar Wrapper Kit INCLUDES 24 chocolate bar wrappers and 24 foils, perfect for styling an adorable pink and gold princess candy buffet or unique Little Princess Crown baby shower or birthday party favors. 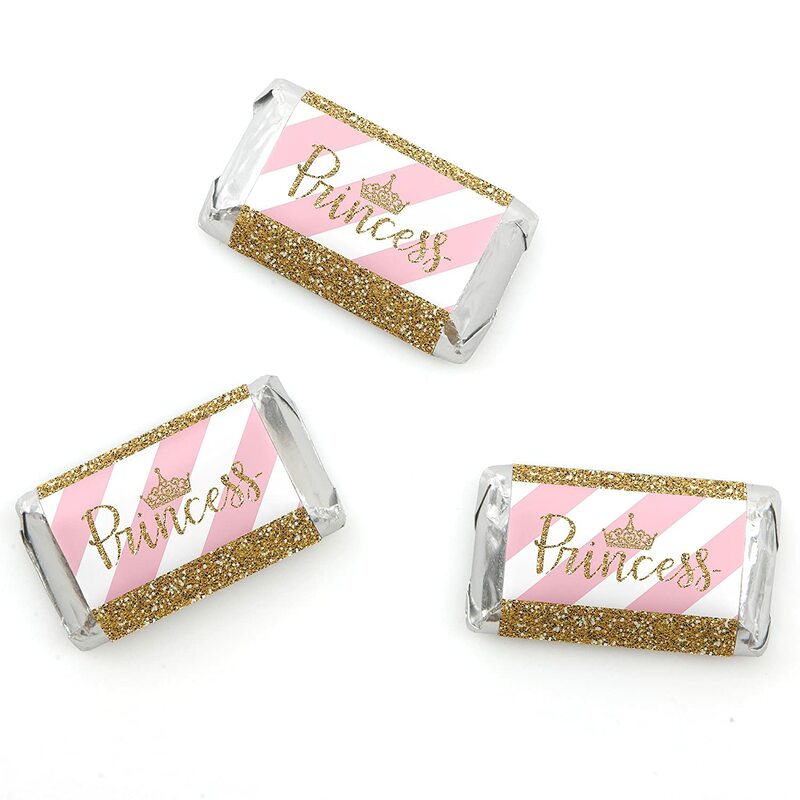 Little Princess Crown candy bar wrappers MEASURE 5.25 inches wide x 6.25 inches high and will quickly add the Little Princess Crown party theme to all your sweet treats. 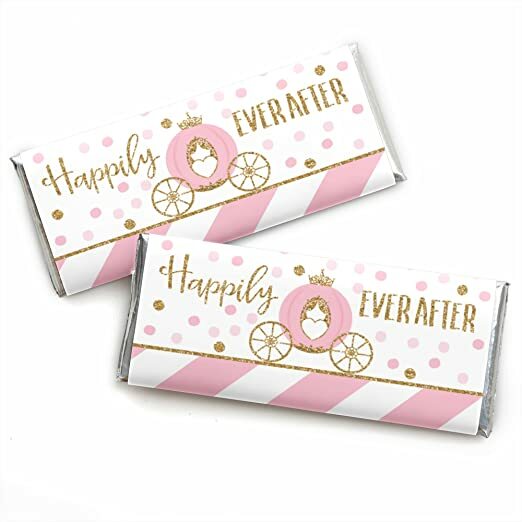 It is easy to wrap Hershey’s standard sized candy bars with these cute pink and gold Happily Ever After paper wrappers and foils! EASY PARTY DECORATIONS: Decorated Little Princess Crown candy bars are an easy baby shower or birthday party favor to gift all your guests. Set a decorated candy bar at each placesetting, package in small gift bags as a party favor or display in a pretty bowl at your candy buffet. Get creative with your pink and gold princess DIY baby shower or birthday party decoration ideas! PREMIUM PARTY SUPPLIES: Little Princess Crown chocolate candy bar wrappers are professionally printed on heavy-duty paper with a photo-like shine. They are individually inspected and carefully packaged by hand with silver foil wraps. Follow the included instructions to quickly wrap a foil around each chocolate candy bar and then add the printed paper wrapper, securing with tape. Little Princess Crown Giant Circle Confetti INCLUDES 27 large baby shower or birthday party confetti. 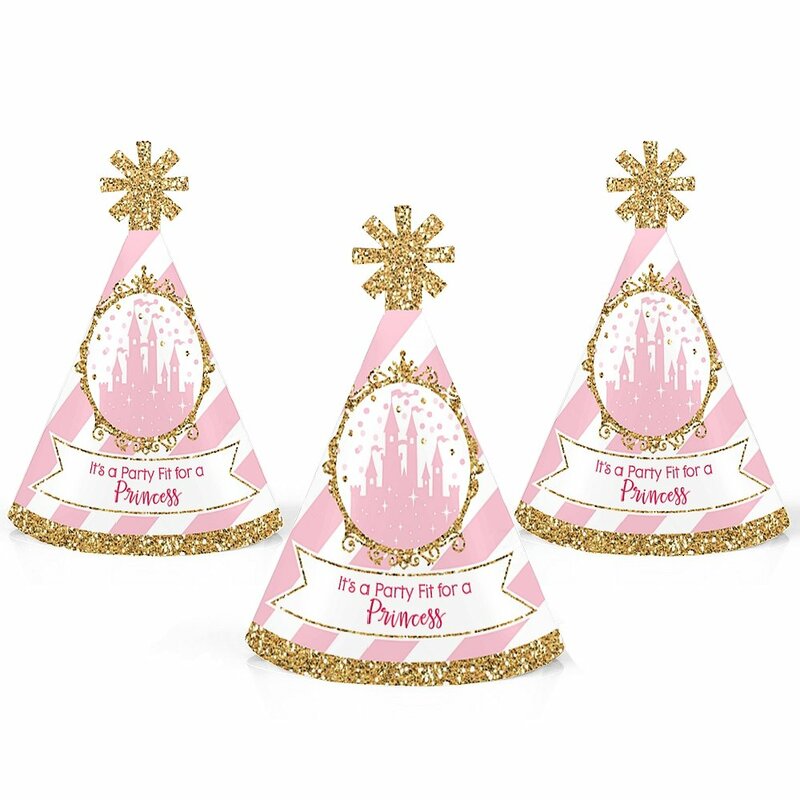 Little Princess Crown party decorations are perfect for a pink and gold princess party. Little Princess Crown giant circle confetti SIZE 5.5 inches large circles, six qty; 4.25 inches medium circles, nine qty; and 2.75 inches small circles, twelve qty. 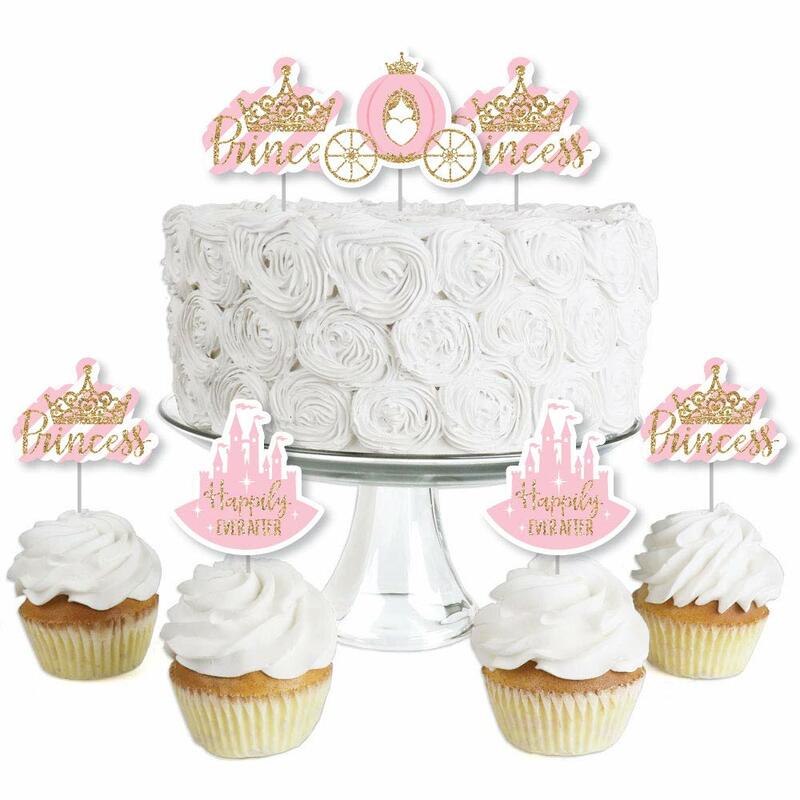 The unique design and large size makes these princess party decorations an impressive addition to any baby shower or birthday party. EASY TABLE DECOR: Little Princess Crown giant circle confetti comes in a variety of coordinating patterns in three different sizes. Scatter them down the length of your party tables, add them to centerpieces or hole-punch them and string together as a baby shower or birthday party banner. Pink and Gold Princess paper confetti pieces will make a statement however you choose to use them. Little Princess Crown Mini Party Hats INCLUDES 10 Pink and Gold Princess party hats with elastic chin straps. Mini baby shower or birthday party hats will fit both children and adults. 10 Little Princess Crown party hats SIZE 4.5 inches tall and 3 inches in diameter at the base. The included elastic chin straps measure 12 inches long. 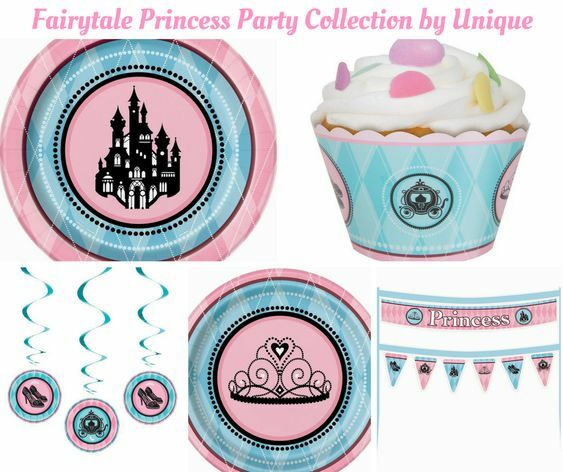 These cute princess party accessories feature a unique star cut-out decoration at the top and the printed saying “It’s a Party Fit for a Princess”. Little Princess Crown Straw Decor INCLUDES 24 castle and tiara paper cut outs, 25 coordinating paper straws & clear stickers for easy assembly. Yes, you’ll receive one extra straw. Little Princess Crown DIY party supplies are perfect for a baby shower or birthday party. Little Princess Crown Straw Decor party kit SIZE 8 castles 3” wide x 3” tall; 8 tiaras 3” wide x 2.5” tall; 8 carriages 3” wide x 2.5” tall; and 25 chevron striped paper straws 7.75″ tall. EASY PARTY DECORATIONS: Little Princess Crown straw décor will add a touch of style to your baby shower or birthday party tables. Pink and gold princess straw décor will also look great at your beverage bar. 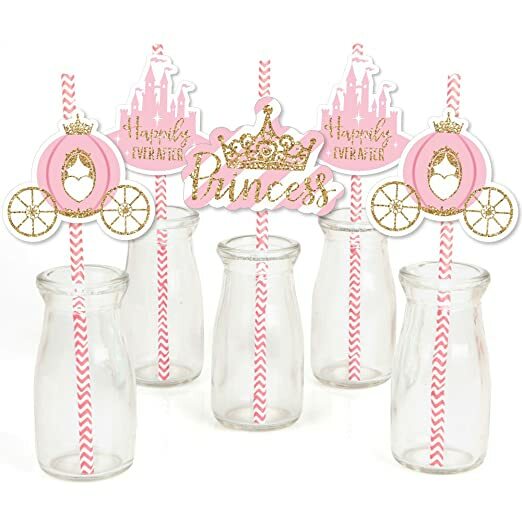 Use these adorable princess carriage party accessories as straws or swizzle sticks. The paper straws can also be cut in half and used as cupcake picks once the shaped cut out is attached. 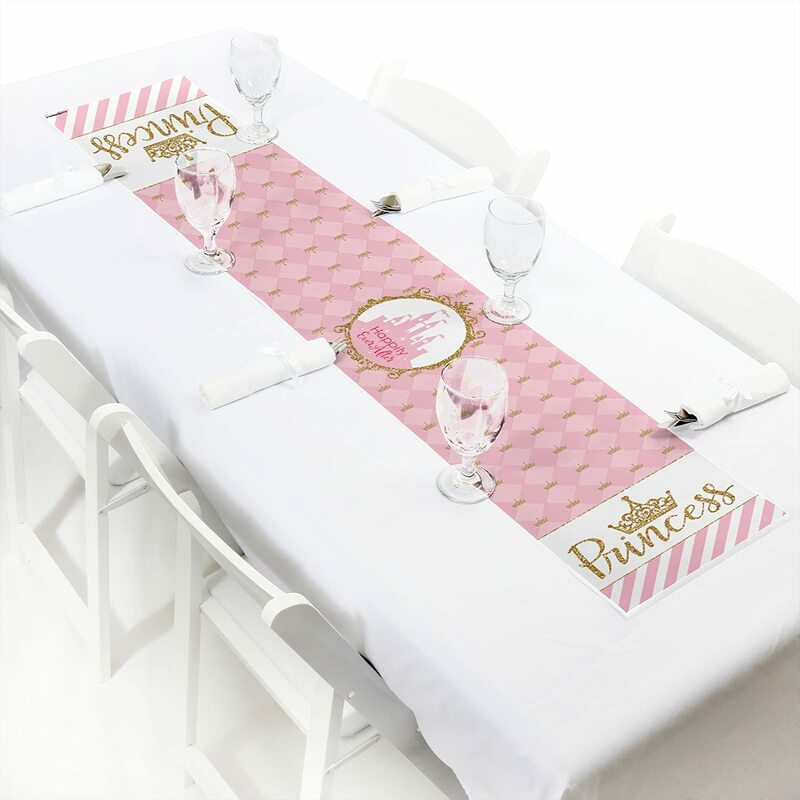 Little Princess Crown paper table runner is a perfect baby shower or birthday party decoration for gift tables, candy buffets or dining tables. SIZE: Little Princess Crown baby shower or birthday party petite table runner measures 1 foot by 5 feet. EASY PINK AND GOLD PRINCESS PARTY DECORATIONS: Little Princess Crown Party Table Runner is an easy way to decorate for your baby shower or birthday party and bring the princess party theme to life. Easily dress up any food or gift table with this cute paper table runner. 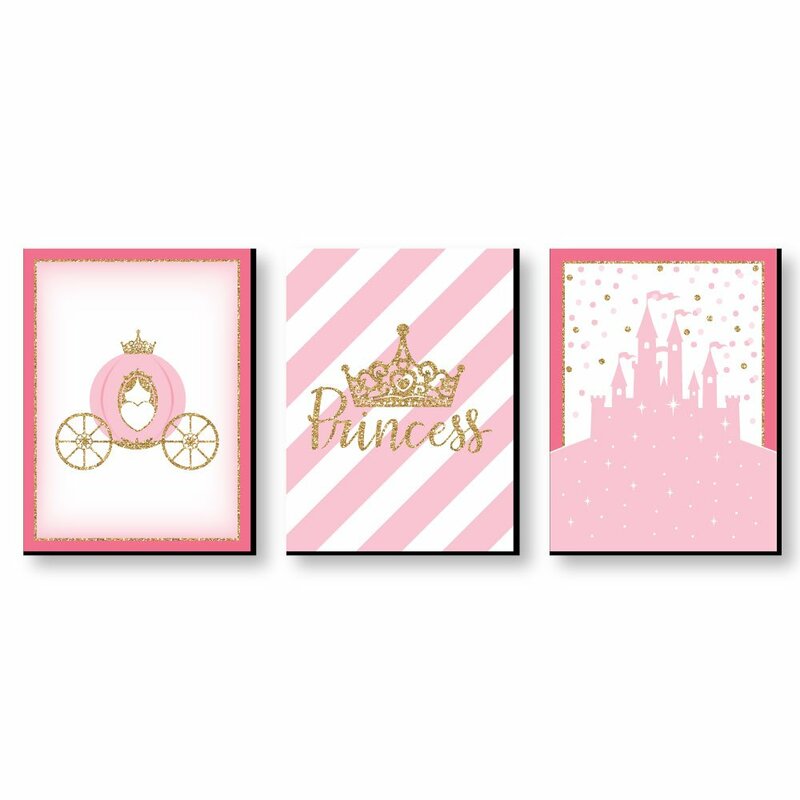 Little Princess Crown Wall Art Set INCLUDES 3 ready-to-hang princess themed panels and non-marking wall mounts for easy hanging. Little Princess Crown artwork is perfect for a nursery, kids room or playroom. Little Princess Crown Wall Art & Kids Room Decor SIZE each 10 inches high x 7.5 inches wide x .5 inches thick. Pink princess lightweight art prints will arrive ready to use – no frame needed. The black edge gives each print a modern, finished look. EASY TO HANG: Simply attach a non-marking wall mount (included) to each corner of a Little Princess Crown art panel and press to hang in desired location. Wall mounts are repositionable, so you can redesign your artwork display at any time. PREMIUM HOME DECOR: 3-piece Little Princess Crown Wall Art Set is professionally printed on thick material with a black edge. You will not need to frame this set of royal princess room decor. Each standout print is ready to hang and will add a contemporary touch to any room. 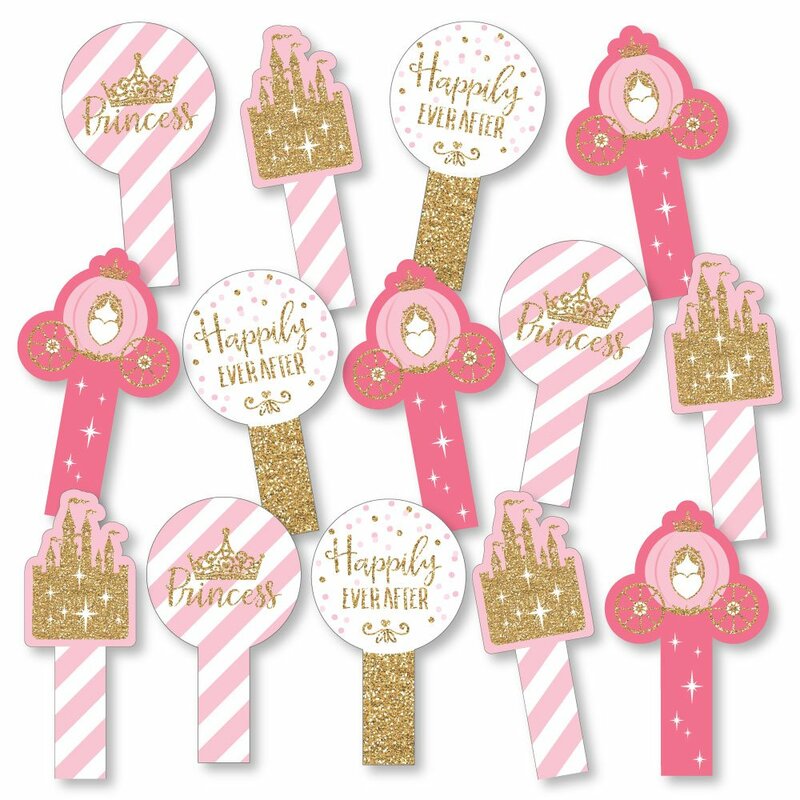 Little Princess Crown – Pink and Gold Centerpiece Sticks INCLUDES 15 Little Princess Crown – Pink and Gold table toppers in three different shapes, 15 wooden dowel sticks and stickers for easy assembly. 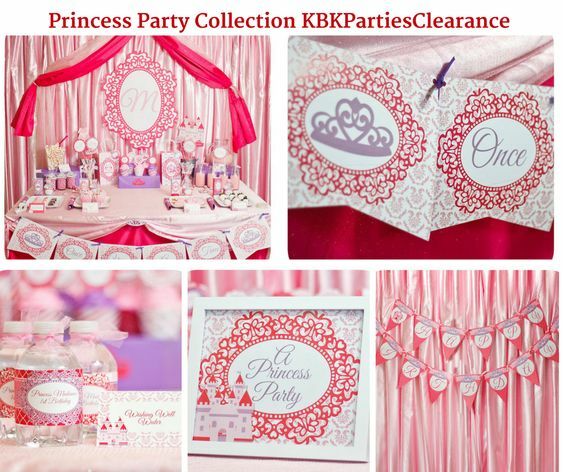 Pink princess party table decorations are perfect for a baby shower or birthday party. Little Princess Crown – Pink and Gold Party Centerpiece Sticks SIZE five Castle table toppers, 8.25” wide x 11” tall; five Carriage table toppers, 6.5” wide x 5.75” tall; and five Tiara table toppers, 7” wide x 4.75” tall. The unique design and variety of pieces makes this table decoration kit an impressive addition to any princess tiara theme party. 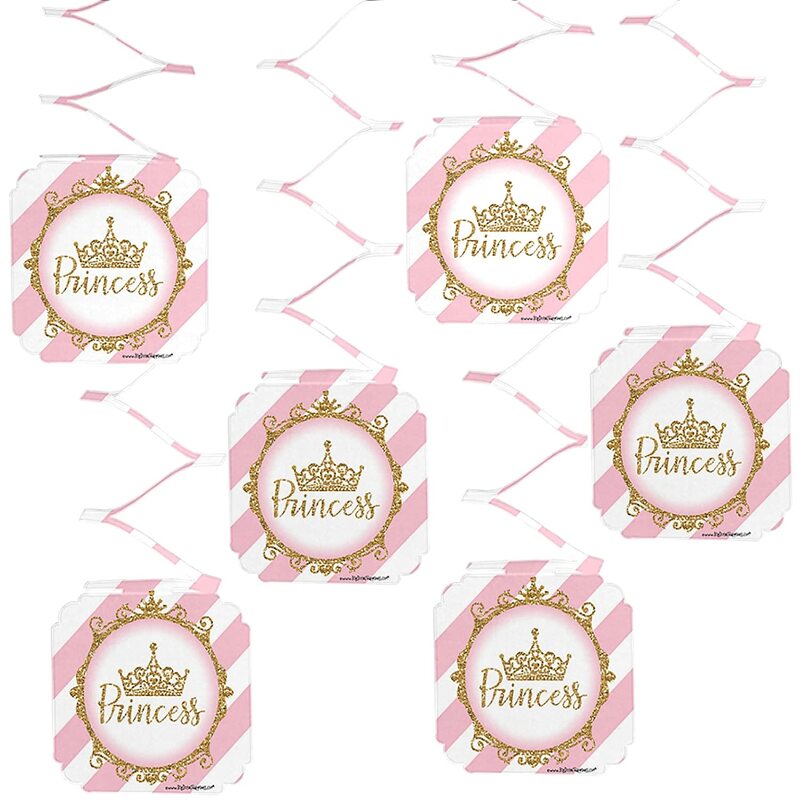 Little Princess Crown Cupcake Wrappers INCLUDES 12 decorative cupcake wraps. Little Princess Crown cupcake supplies are perfect for a baby shower or birthday party. 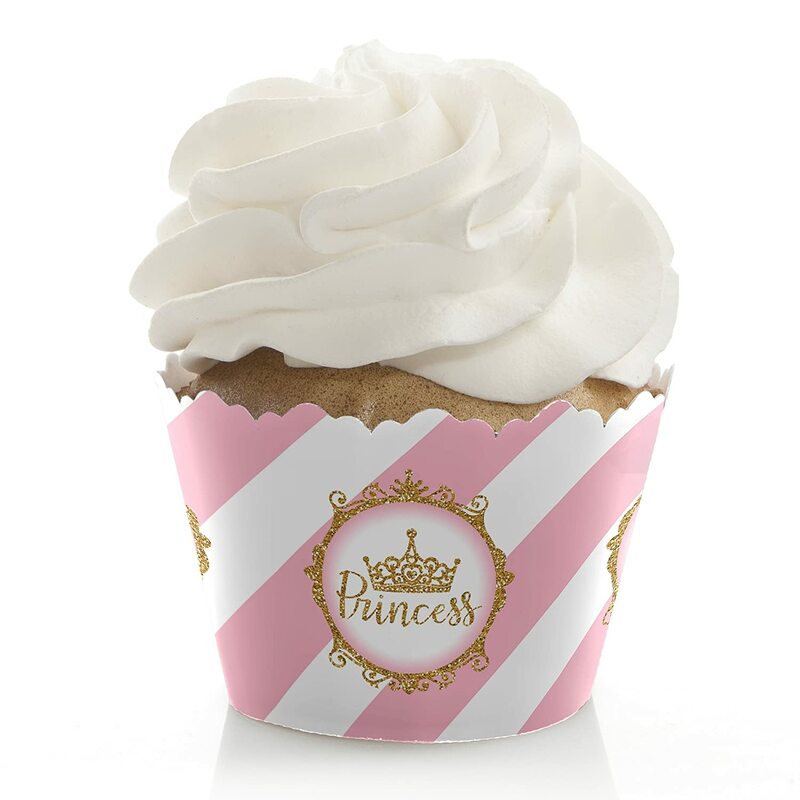 SIZE: Little Princess Crown cupcake wrappers are adjustable up to 2″ wide in diameter. Decorative cupcake wrappers will fit standard and medium sized cupcakes, easily hiding the baking wrapper and creating a pretty party treat. 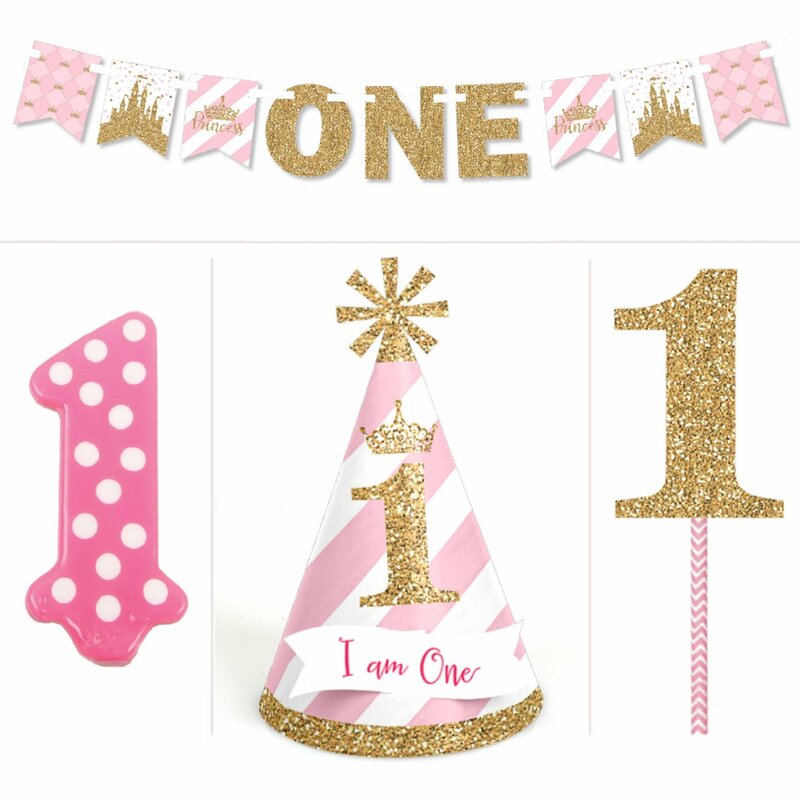 Little Princess Crown Smash Cake Kit INCLUDES 1 Little Princess Crown bunting banner with princess tiara pennants and O-N-E letters, 1 I AM ONE first birthday mini party hat and number 1 candle. Little Princess Crown smash cake kit is an adorable addition to your 1st birthday party photos. This cute party hat and high chair decoration will help you take adorable party photos that are sure to be enjoyed by all your friends and family – and the guest of honor! 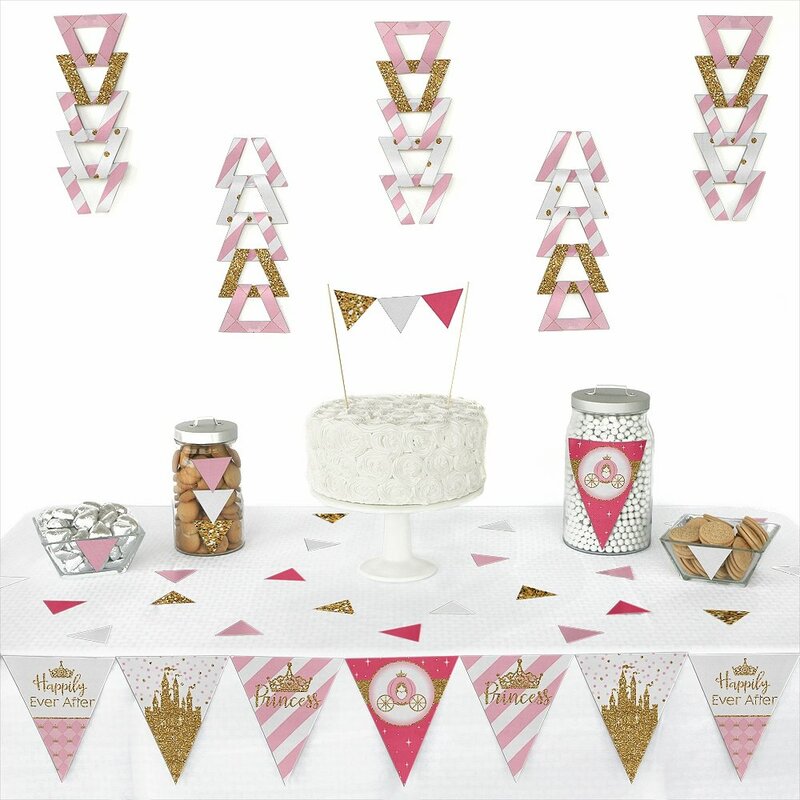 FIRST BIRTHDAY DECORATIONS: The Little Princess Crown bunting banner is perfect for your first birthday photo shoot and then doubles as an adorable high chair decoration at the birthday party. The princess castle pennant flags and shaped O-N-E cut out pennants SIZE 4.5 inches tall x 3.5 inches wide and will easily string onto the included 68” of satin ribbon. Pennant flags are professionally printed on sturdy cardstock paper and will arrive cut, ready to assemble. 10-Piece Funny Pink and Gold Princess Photo Booth Props Kit INCLUDES 10 Little Princess Crown arrow and speech bubble photo booth props, 10 wooden dowel sticks and adhesives for assembly. EASY ASSEMBLY: Simply attach the printed DIY photo booth props to the wooden dowels with included adhesive and reinforcing stickers. 14-Piece Little Princess Crown party paddle props INCLUDES 14 Pink and Gold Princess paddle fans – perfect for photo booth props, party favors, centerpieces and table decorations. Princess party paddles are printed on one side. PERFECT FOR ANY CROWD! 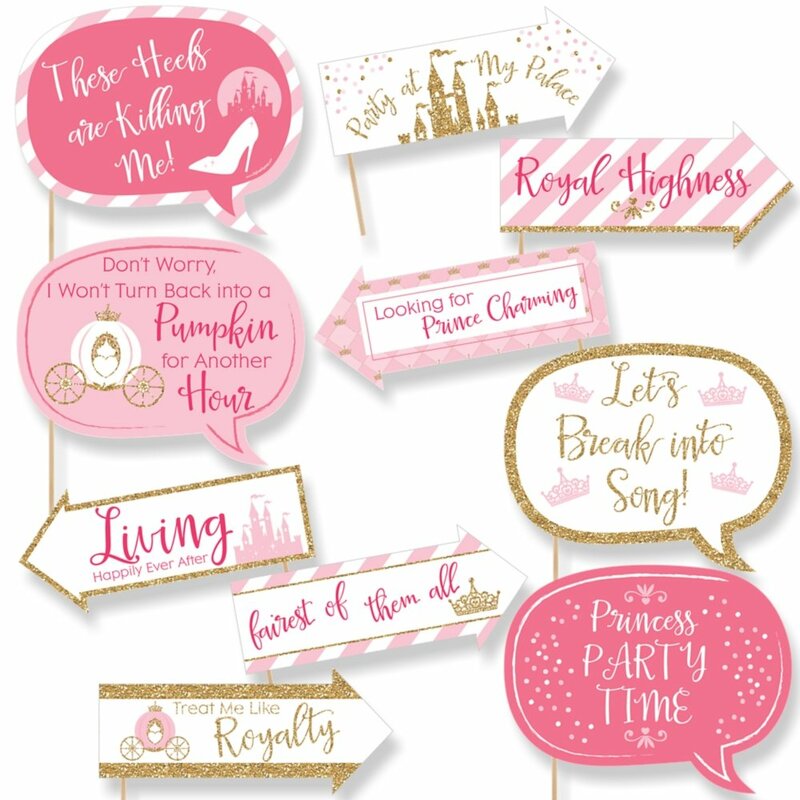 Little Princess Crown party paddle signs are fun baby shower or birthday party decorations for adults and kids – everyone will love these royal princess party supplies. UNIQUE PARTY SUPPLIES: Little Princess Crown party paddles measure 3.75” wide x 6.5” tall. Give them to friends and family as photo props; add a Little Princess Crown baby shower or birthday party paddle fan to table decorations and centerpieces; or use them at your party photo booth for funny party photos. 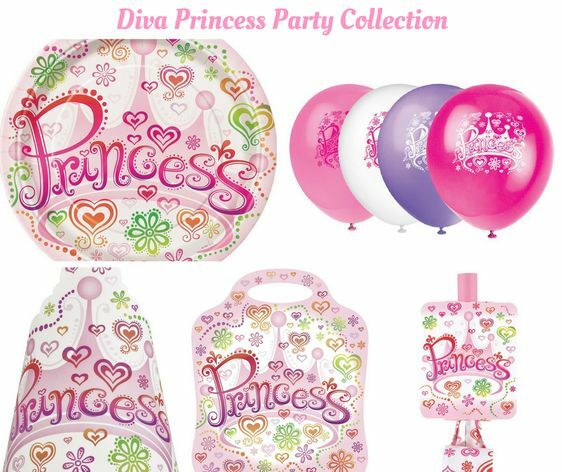 HIGH-QUALITY: Little Princess Crown – Pink and Gold Princess paddle fans are professionally printed on durable plastic. 14-Piece Party Paddle Props are waterproof and can be used outdoors, without any worry. Little Princess Crown party paddle props use a No-Mess Glitter Print: Our party signs are designed with a printed image of glitter, eliminating glitter flake while maximizing bling effect! Signature Mat Alternative Guest Book Kit INCLUDES 1 Little Princess Crown Signature Plaque and 1 Black Ultra Fine Sharpie® Permanent Marker Pen. There isn’t a better way to display your loved one’s wishes from a baby shower or birthday party than with an adorable Pink and Gold Princess signature mat guest book. Little Princess Crown mat SIZE 11.25 inches wide by 16.25 inches high by .5 inches thick. 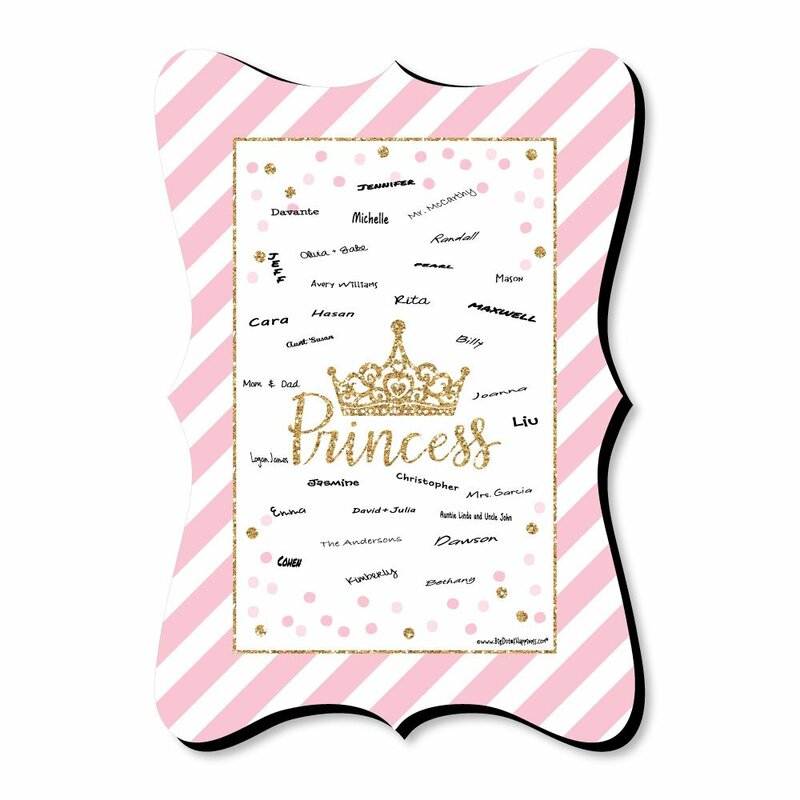 Little Princess Crown signature plaque is professionally printed on thick, sturdy foam board that is professionally cut in an ornamental shape with a black edge for a finished look. UNIQUE PARTY SUPPLIES: Little Princess Crown signature mat is a fun alternative to a traditional baby shower or birthday party guest book. Simply display your Little Princess Crown signature mat alternative and the included fine-point Sharpie® at the door of your party. As your guests arrive, they can write a special note in the light-colored space of the signature mat with the permanent marker. DISPLAY IDEAS: Little Princess Crown baby shower or birthday party signature mat alternative is a lasting memory of the Guest of Honor’s special day. Once your friends and family have added their names and special message to the signature mat, display for everyone to see as they leave the party. Afterward, present this alternative guest book to your Guest of Honor as a memento of their amazing princess party. Little Princess Crown Table Decoration Kit INCLUDES 1 large Pink and Gold Princess centerpiece, 2 scalloped centerpieces, 12 scalloped table confetti pieces and 24 round table confetti pieces. Little Princess Crown party table decorations are perfect for a baby shower, birthday party. 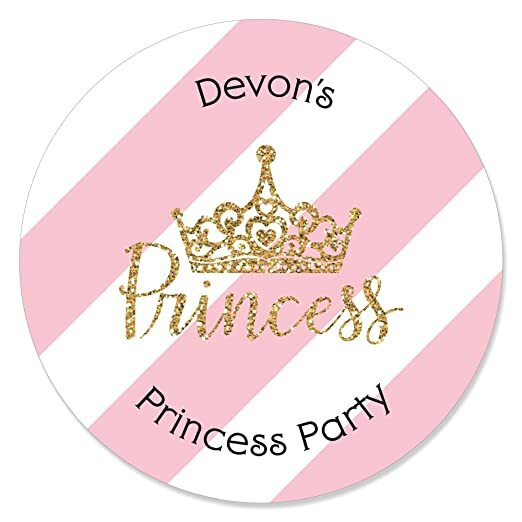 Little Princess Crown Circle Sticker Labels INCLUDES 24 personalized round stickers – perfect for styling adorable pink and gold baby shower or birthday party favors, or for sealing invite and thank you envelopes. 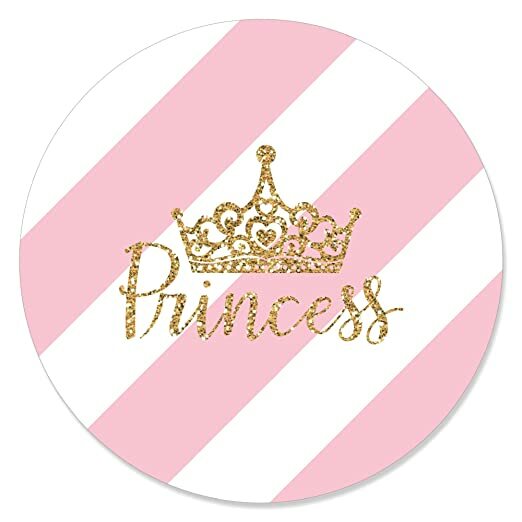 Little Princess Crown round stickers MEASURE 1.75 inches diameter and will quickly add a personal touch to all your baby shower or birthday party favors. 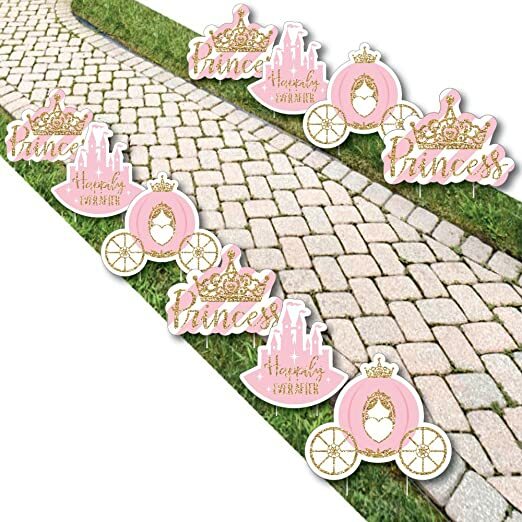 Simply click “customize now” to add your personalized text to these fun princess circle labels. PERSONALIZED PARTY DECORATIONS: Custom Little Princess Crown stickers are an easy-to-use DIY party supply to add to your list of decorations. Use baby shower or birthday party stickers on cups or centerpieces to create fun place settings; add to party favors; or use afterward in your party scrapbook. Get creative with your princess DIY birthday party or baby shower decoration ideas! HIGH-QUALITY PARTY SUPPLIES: Little Princess Crown round sticker labels are professionally printed on sticker paper with a photo-like shine. They are individually inspected and carefully packaged by hand. 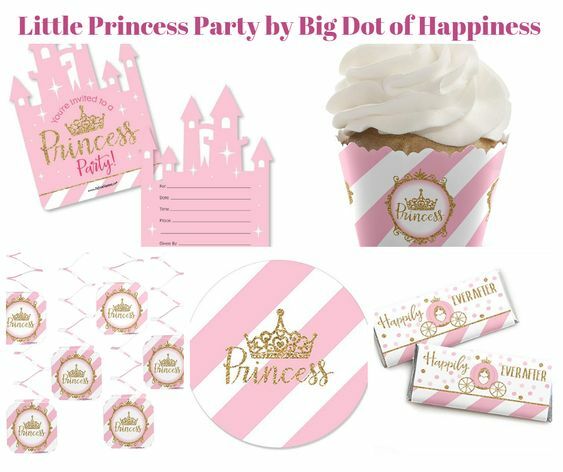 Bring your do-it-yourself party ideas to life when you add personalized Little Princess Crown circle stickers to your party decor. 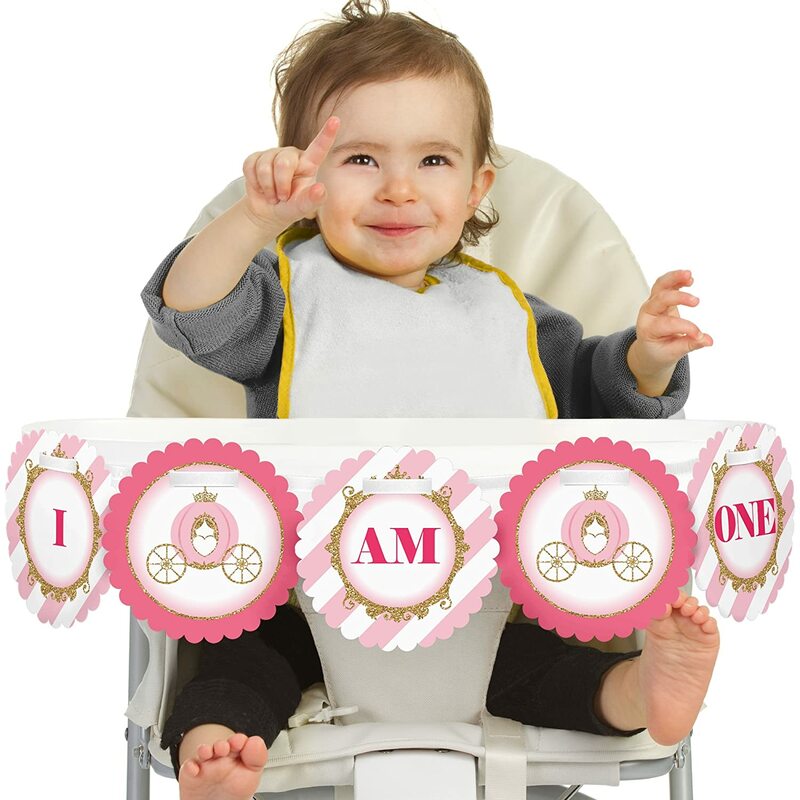 MADE IN THE USA: Little Princess Crown – Baby Shower or Birthday Party Circle Sticker Labels are designed and manufactured at our Wisconsin facility using materials that are Made in the USA. 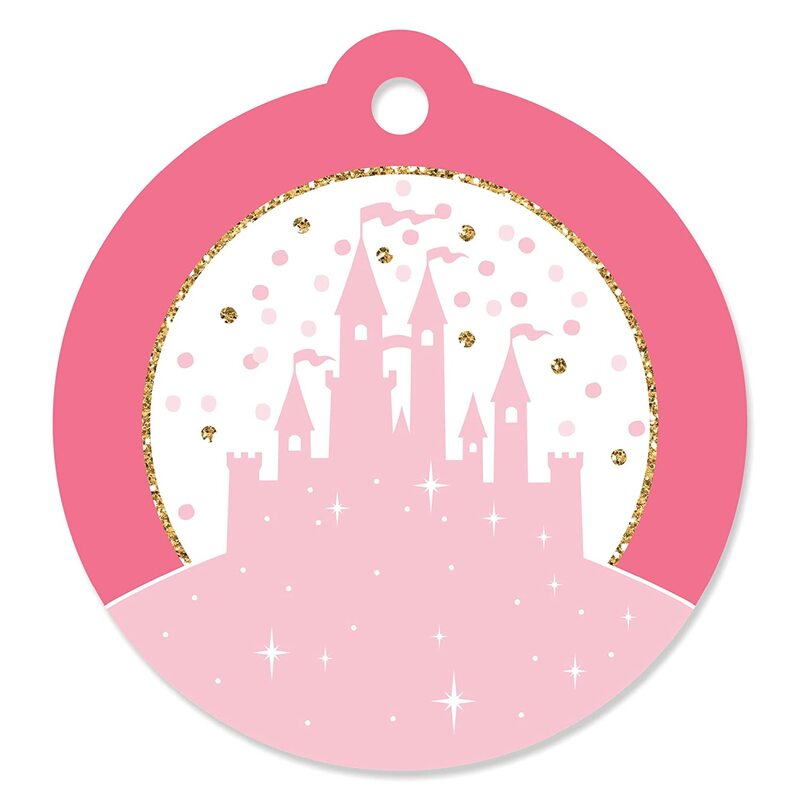 Princess Candy Stickers use a No-Mess Glitter Print: Our stickers are designed with a printed image of glitter, eliminating glitter flake while maximizing bling effect! Little Princess Crown Scratch-Off Cards INCLUDES 22 baby shower or birthday party game cards: 20 “loser” cards and 2 “winner” cards. FUN PARTY GAME: Little Princess Crown scratch-off cards will be enjoyed by baby shower or birthday party guests of all ages. Each game card measures 2.75” tall x 4.75” wide. Winner and loser game cards are packaged separately so it is easy to pre-select the game winners if you choose. 3 WAYS TO PLAY: Simple – Greet guests as they arrive and hand them a scratch-off card. Quick – Display one scratch-off card at each place setting and have guests play before eating. Favorite – Give scratch-off cards out as mini prizes during other party games. The winning scratch off card(s) gets a grand prize. 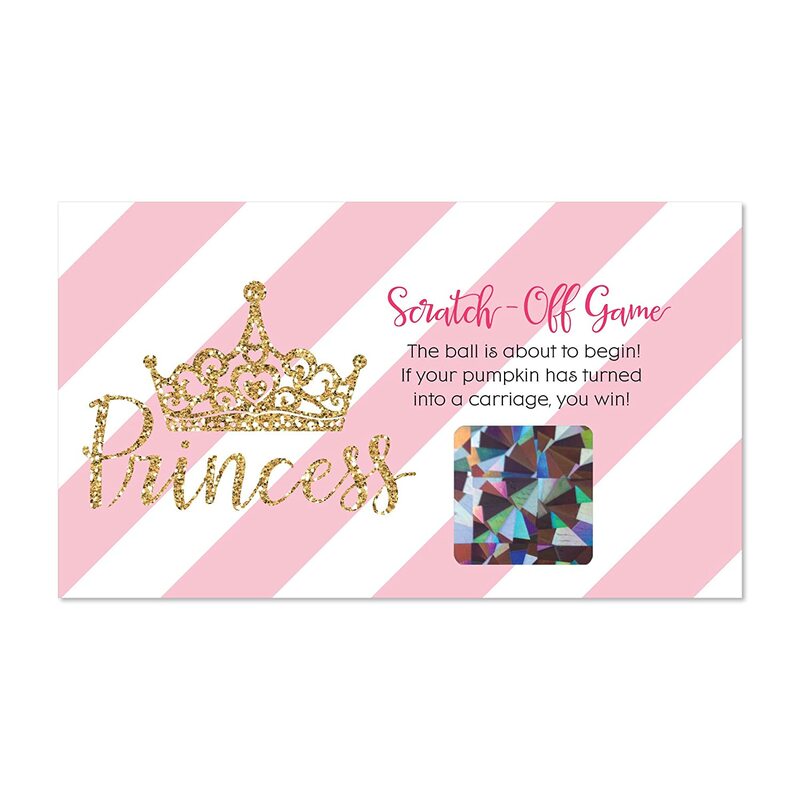 HIGH-QUALITY PARTY SUPPLIES: Little Princess Crown Scratch-Off Cards are professionally printed on heavy-duty cardstock paper with a photo-like shine. They are individually inspected and carefully packaged by hand, with winner cards and loser cards clearly marked. This fun baby shower or birthday party game will arrive ready to use at your party. 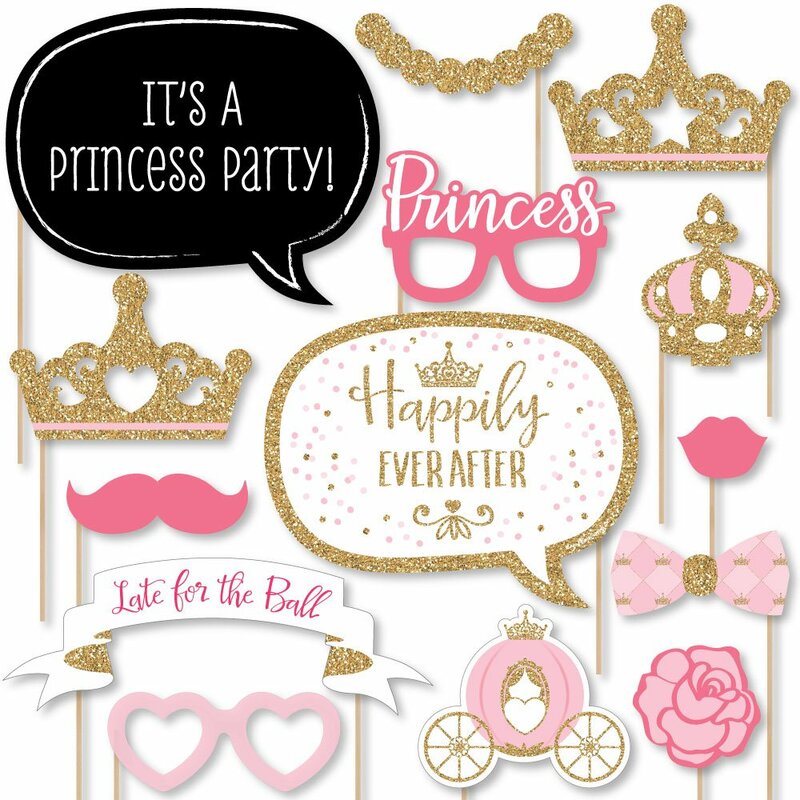 Little Princess Crown Circle Sticker Labels INCLUDES 24 round stickers – perfect for styling adorable pink and gold princess birthday party or baby shower favors, or for sealing invite and thank you envelopes. 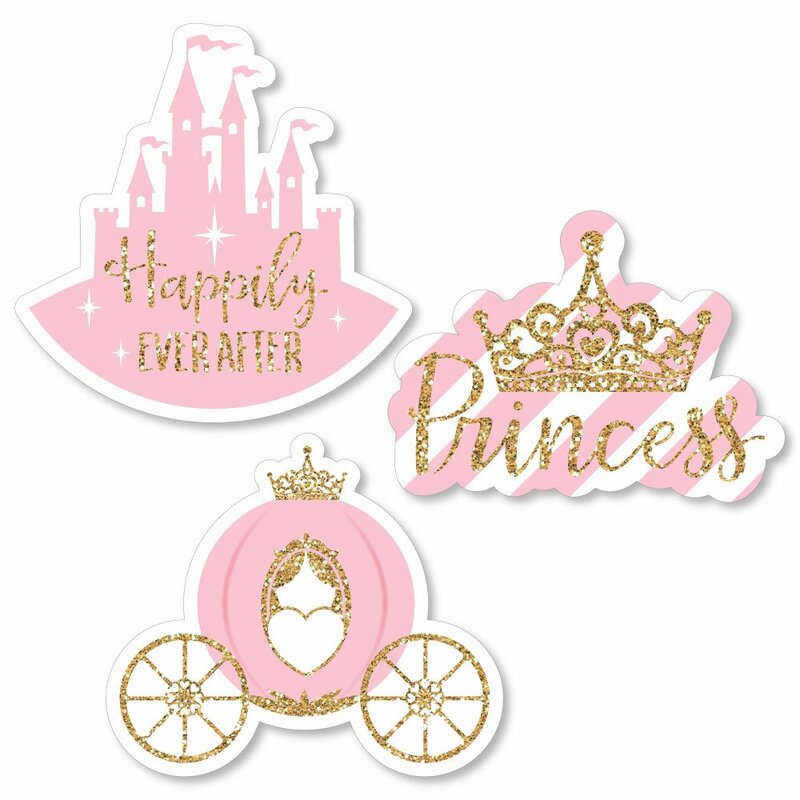 Little Princess Crown round stickers MEASURE 1.75 inches diameter and will quickly add a personal touch to all your baby shower or birthday party favors. EASY PARTY DECORATIONS: Little Princess Crown stickers are an easy-to-use DIY party supply to add to your list of decorations. Use baby shower or birthday party stickers on cups or centerpieces to create fun placesettings; add to party favors; or use afterward in your party scrapbook. Get creative with your pink and gold princess DIY baby shower or birthday party decoration ideas! PREMIUM PARTY SUPPLIES: Little Princess Crown round sticker labels are professionally printed on sticker paper with a photo-like shine. They are individually inspected and carefully packaged by hand. 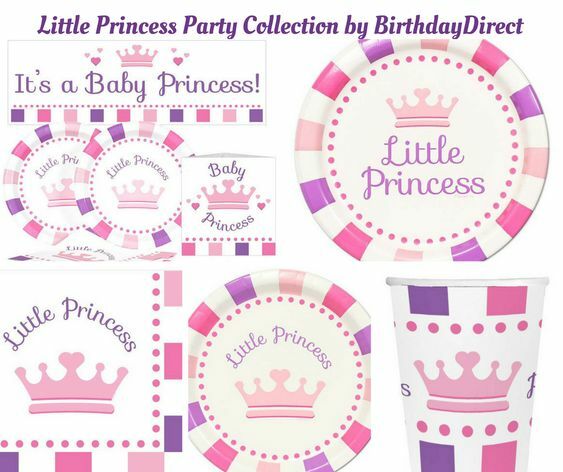 Bring your do-it-yourself party ideas to life when you add Little Princess Crown circle stickers to your party decor. 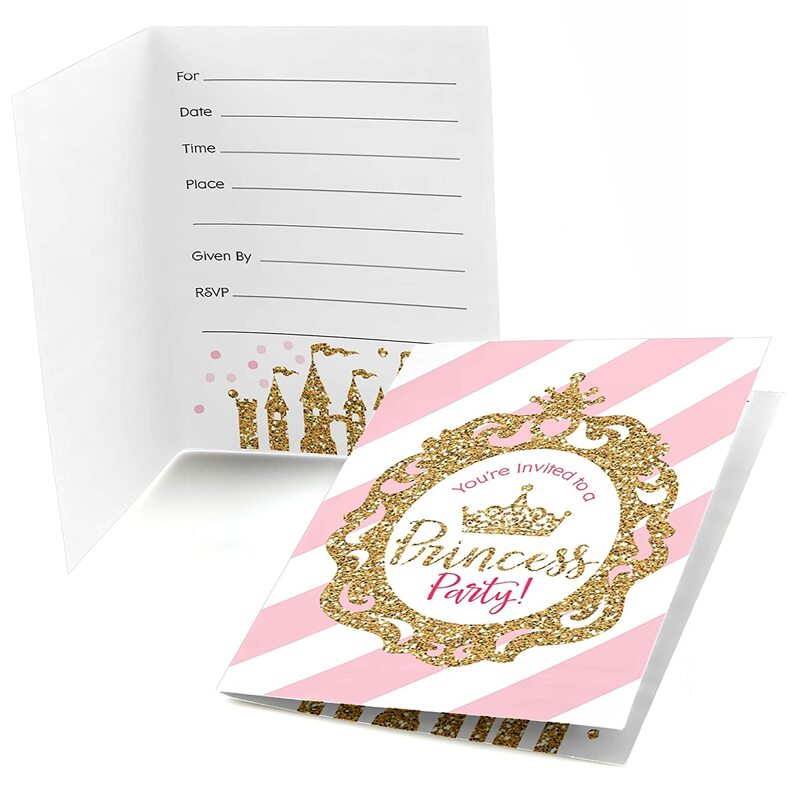 Little Princess Crown Fill-In the Blank Invitation Set INCLUDES 8 Pink and Gold Princess invitations and premium white envelopes. The royal princess theme is great for a baby shower or birthday party. Little Princess Crown party invitations SIZE 5.5 inches by 3.75 inches, folded. The included envelopes measure 5.75 inches by 3.75 inches. PREMIUM PARTY INVITATIONS: Little Princess Crown baby shower or birthday party invitations are professionally printed on heavy-duty card stock paper with a photo-like shine. They are then hand-folded and individually inspected, then carefully packaged with our exclusive squiggle flap envelopes, making this princess stationary set a must-have for any baby shower or birthday party. 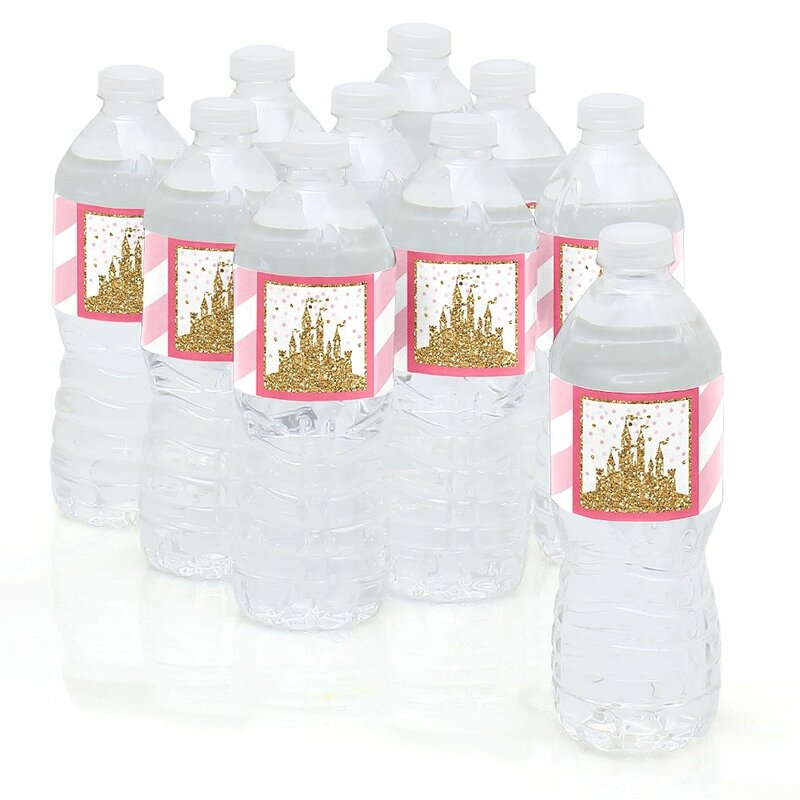 Little Princess Crown Water Bottle Sticker Labels INCLUDES 10 DIY water bottle labels. Little Princess Crown DIY party supplies are perfect for quickly dressing up any beverage bottle in your party theme. Water bottle stickers each SIZE 8″ wide x 2″ tall, perfect for any beverage bottle or container less than 8″ in diameter. EASY TO USE: Prepare your water bottles or containers by ensuring they are room temperature and dry. Removing the original bottle label is preferred but not necessary. Carefully peel one Little Princess Crown sticker label from the backing and adhere to a bottle, starting at the middle and pressing toward edge. Smooth label around container and chill your beverages if needed. Little Princess Crown Mini Candy Bar Wrappers INCLUDES 20 candy stickers, perfect for styling an adorable little princess candy buffet or unique pink and gold baby shower or birthday party favors. Little Princess Crown mini candy bar wrappers MEASURE 1.5” wide x 2.5” high and will quickly add a personal touch to all your sweet treats. 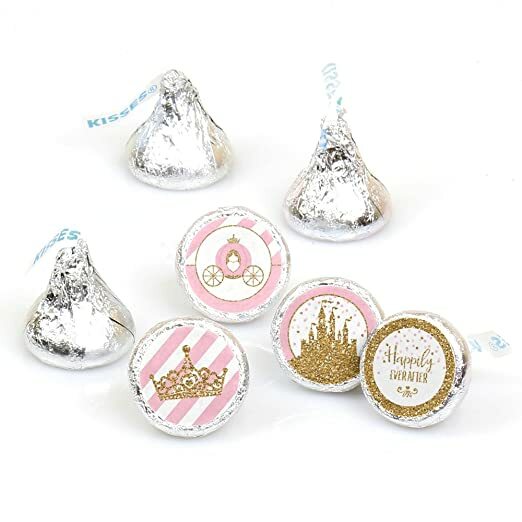 It is easy to wrap Hershey’s Miniature candy bars with these cute Little Princess Crown stickers! 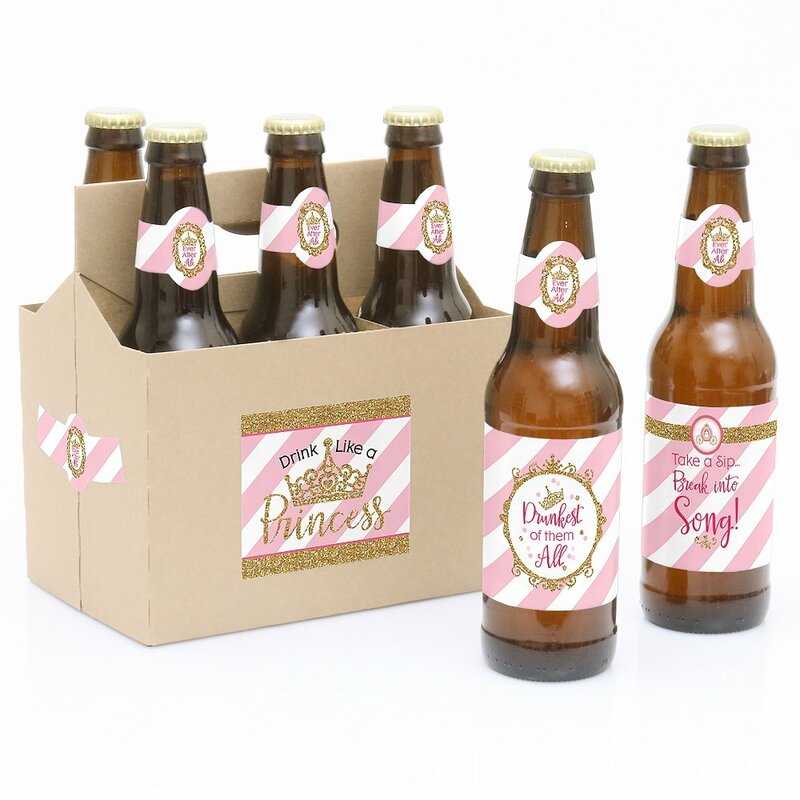 Little Princess Crown Beer Gift Set INCLUDES 6 beer bottle sticker labels & 6 bottle neck labels in the princess theme, as well as 1 six-pack carrier with 4 pink and gold princess baby shower or birthday party stickers for decoration. Princess Beer bottle stickers each SIZE 3.5″ wide x 3″ tall, perfect for standard beer bottles or similarly sized soda bottles; Beer collar neck labels measure 3.5″ long x 1.5″ wide at the center. Beer bottle labels are quick to apply and will give your Little Princess Crown gift a personal touch! 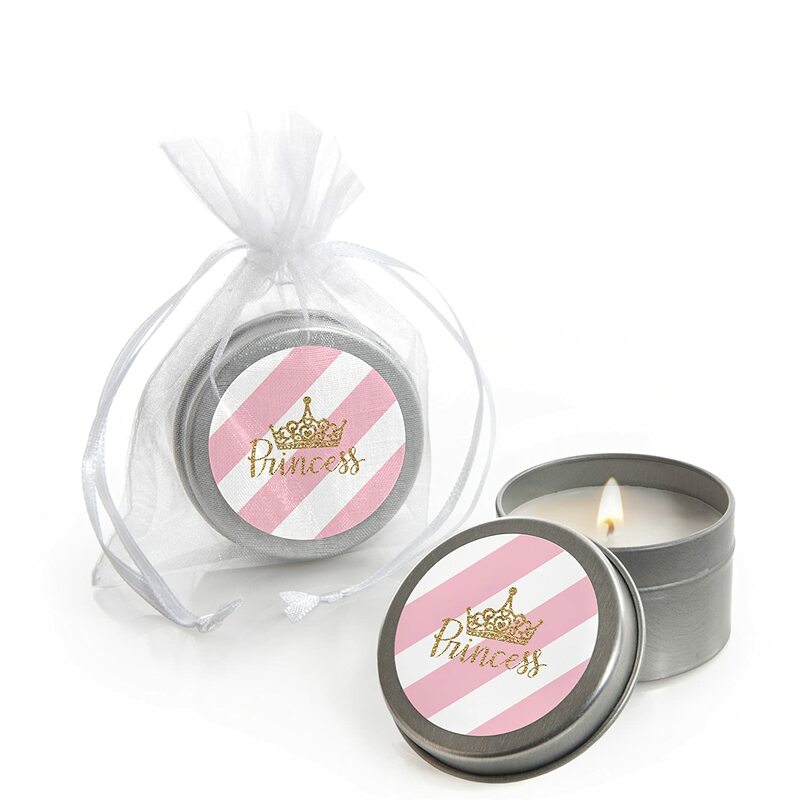 Little Princess Crown Candle Tin Party Favors INCLUDES 12 candles in decorated tins and organza bags for gifting. 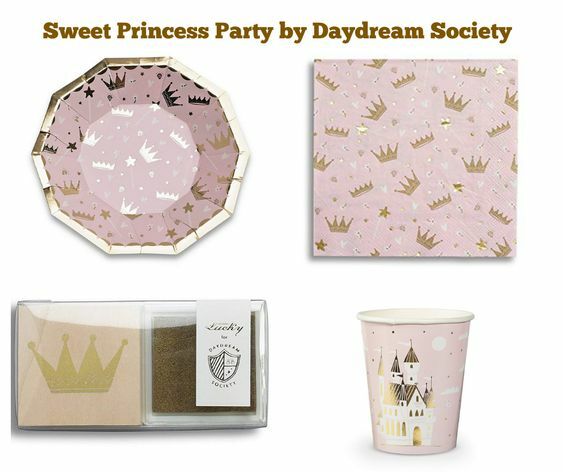 Pink and gold princess candle tins make adorable baby shower favors. Little Princess Crown party favor candles MEASURE 2 inches diameter x 1 inch high, each holding a 2-ounce candle. Travel-sized candle tin party favors are lightly scented and will quickly add a personal touch to all your baby shower favors. Little Princess Crown Dessert Cupcake Toppers INCLUDES 24 clear treat picks, 24 shaped paper cut outs and stickers for easy assembly. DIY Little Princess Crown cupcake supplies are perfect for a baby shower or birthday party. Plastic clear treat pick SIZE 4 inches tall with the completed height of the Little Princess Crown Dessert Cupcake Topper depending on where the plastic pick is attached to the shaped paper cut out. Cupcake toppers are perfect for standard cupcakes and can also be added to appetizers and individual servings of other sweet treats such as brownies or donuts, and even used to create small fruit kabobs. 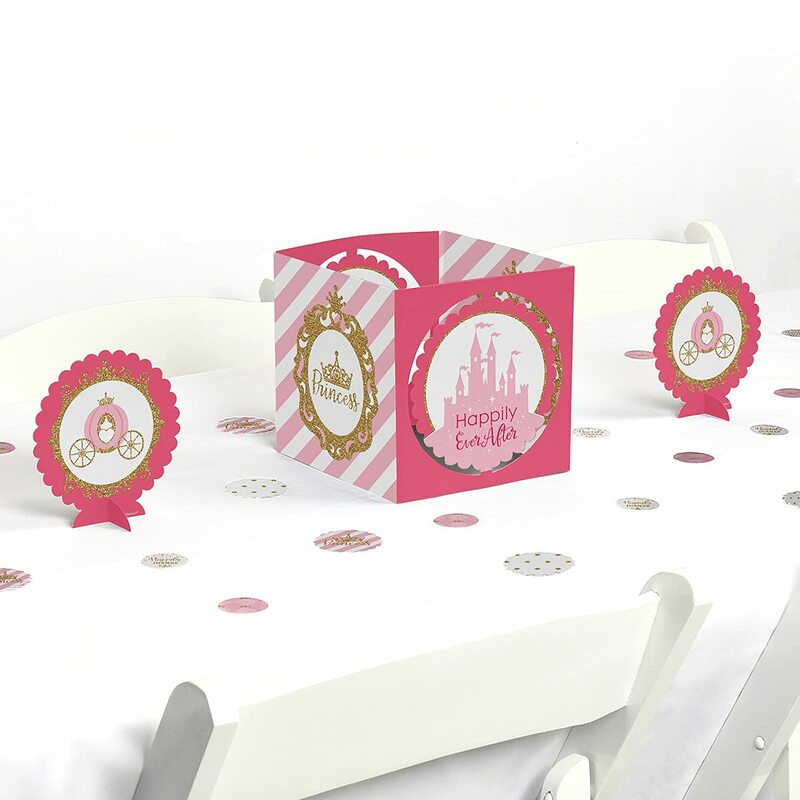 Little Princess Crown High Chair Banner is an impressive 1st birthday party decoration for your princess party. High chair decorations for first birthday INCLUDES princess themed I AM ONE letter pennants, Little Princess Crown pennants and satin ribbon. 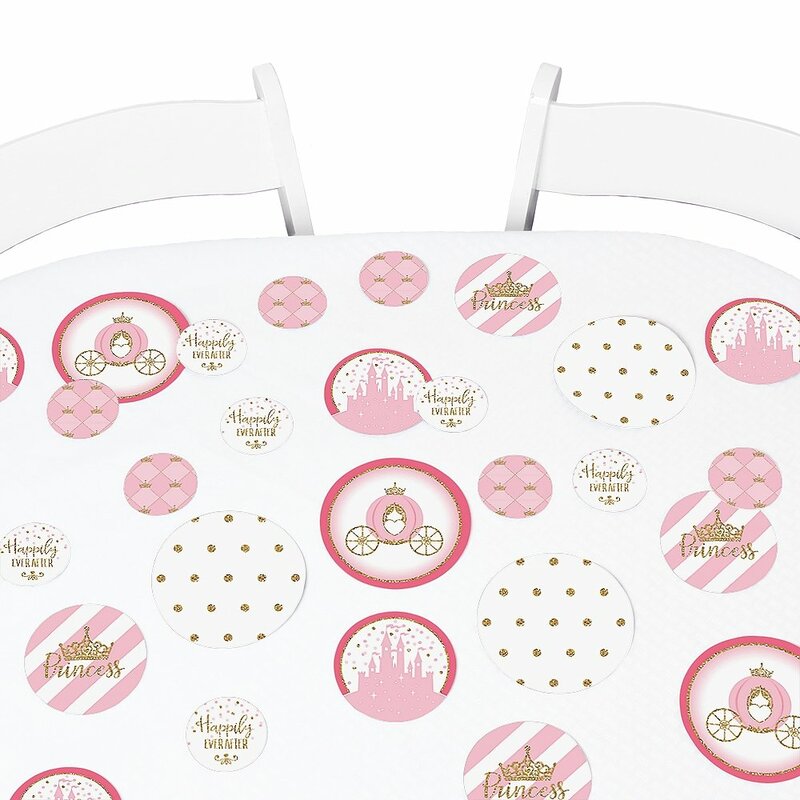 Little Princess Crown Birthday Party High Chair Banner SIZE: Each scalloped circle pennant measures 5.25 inches in diameter and ribbon measures 5.5 feet long and 3/8 inch wide. Little Princess Crown DIY Party Essential Kit INCLUDES 20 extra-large tiara and carriage shaped cut outs – Great for bringing all your DIY baby shower or birthday party ideas to life! 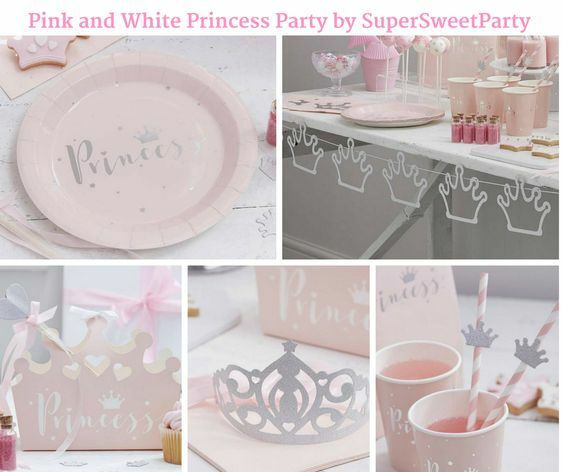 DIY PARTY SUPPLIES: Little Princess Crown party essentials include 20 large cut outs in princess shapes that coordinate with the pink and gold party theme. Set of 20 baby shower or birthday shapes SIZE 10 crown shapes 6.5” x 5.75”; 10 carriage shapes 6.5” x 5.75”. 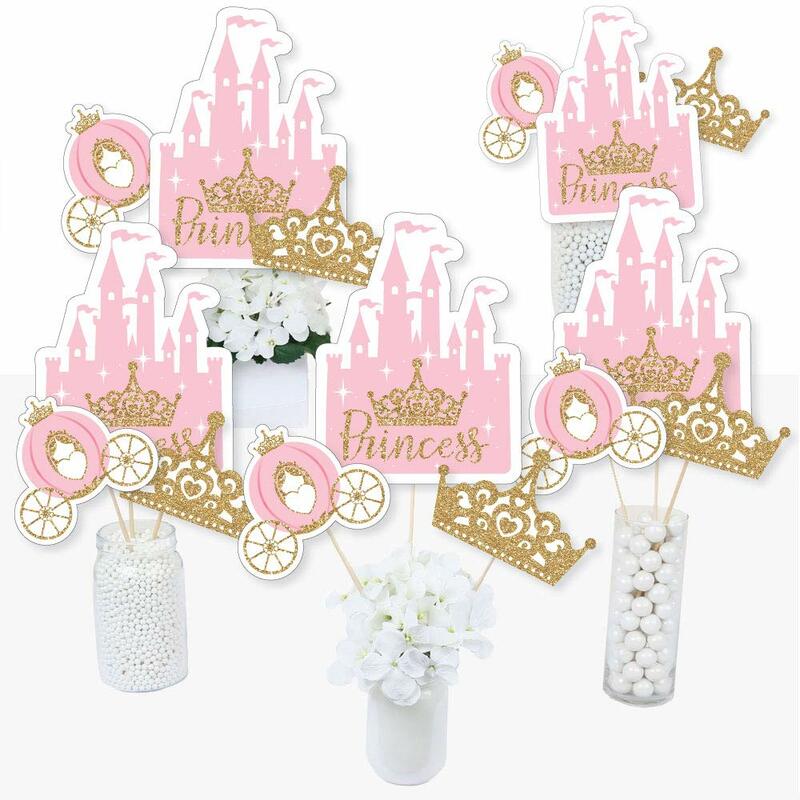 The unique design and large size makes these princess kingdom party decorations an impressive addition to any baby shower or birthday party. BABY SHOWER OR BIRTHDAY PARTY DECORATIONS: Little Princess Crown DIY party essentials are printed with characters on both sides, so they are perfect for centerpieces or hanging decorations. Hole-punch them and string together as a baby shower or birthday party banner, or hang individually as ceiling decorations. Little Princess Crown large shaped cut outs will make a statement however you choose to use them. 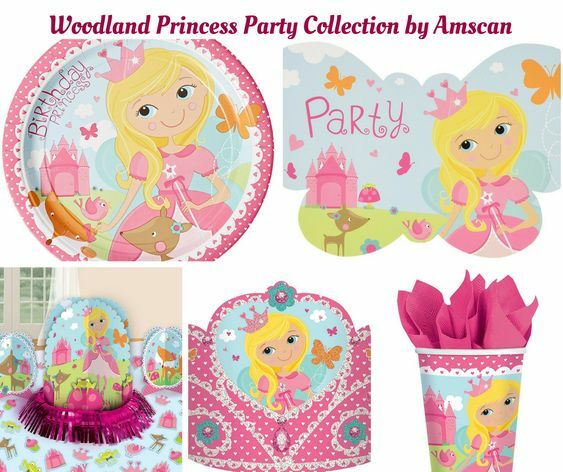 Little Princess Crown party placemats INCLUDES 12 paper placemats. Little Princess Crown baby shower or birthday party placemats are must-have party decoration that will look amazing on all your tables. Little Princess Crown paper placemats SIZE 18″ wide x 12″ high. 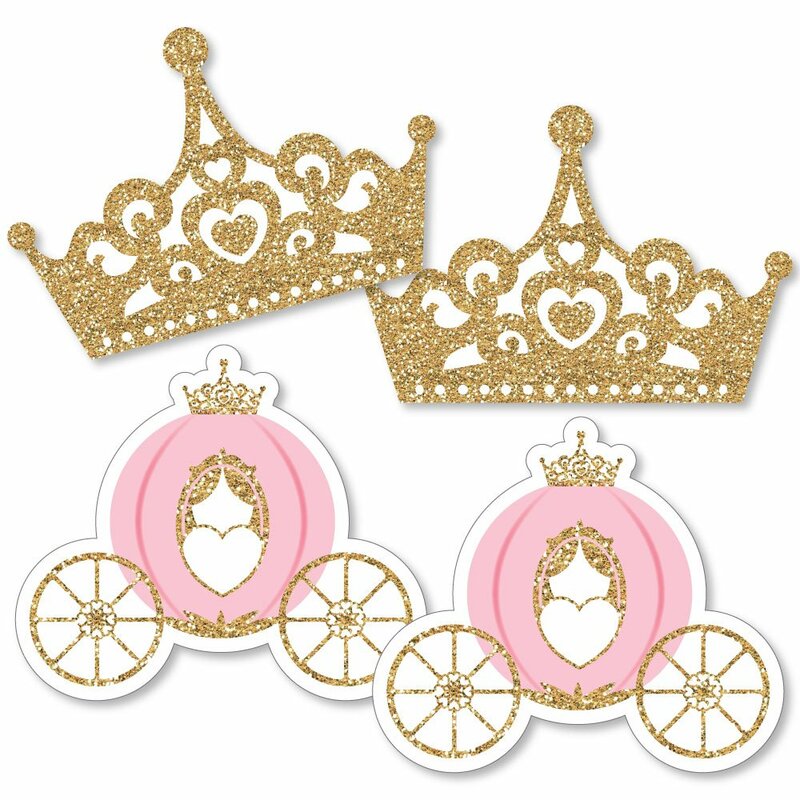 This exclusive design is a stunning way to decorate for a Pink and gold princess baby shower or birthday party. Plus, these disposable party placemats will make it easy to clean up after the event is over. 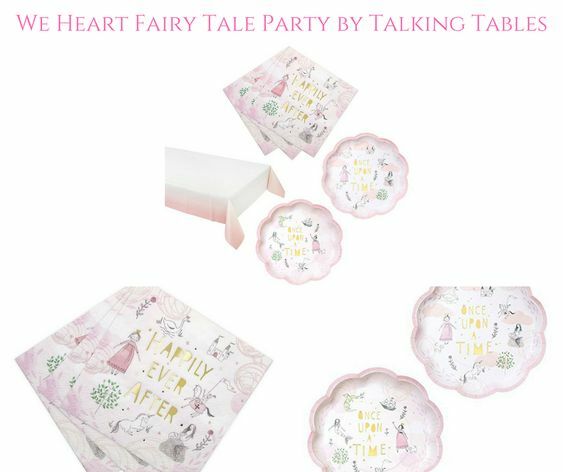 EASY TABLE DECOR: Bring your royal princess baby shower or birthday party theme to all areas of your celebration with cute party placemats. 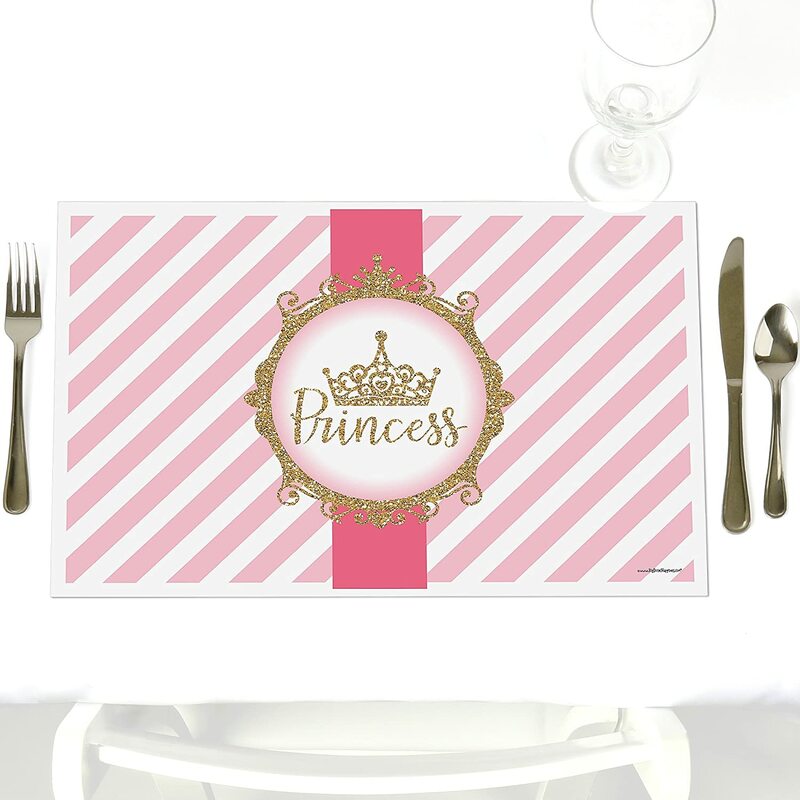 Little Princess Crown placemats are perfect for dining tables, buffet tables and even gift tables or guest book areas. Pink and gold princess party table decorations will make a statement however you choose to use them. 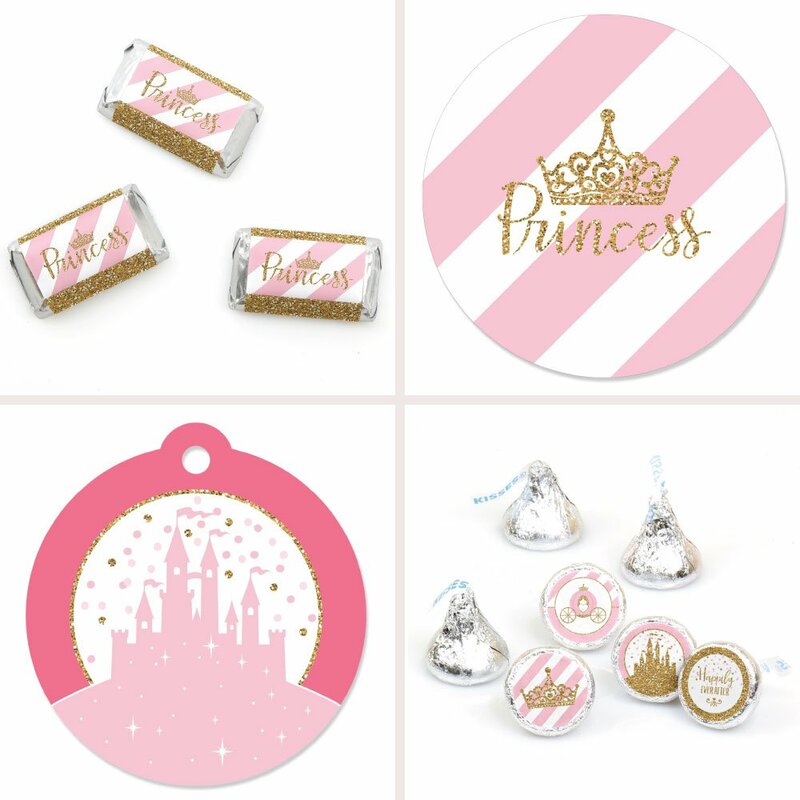 Little Princess Crown Round Candy Favor Labels INCLUDES 108 candy stickers – perfect for styling adorable Pink and gold princess baby shower or birthday party candy favors. Round candy labels will fit a variety of small candies with a flat, round bottom, such as chocolate Hershey’s® Kisses®, wrapped peppermints or gold-wrapped caramel candies. Little Princess Crown small, round candy stickers MEASURE .75 inches diameter and will quickly add a personal touch to all your sweet treats at the party. Little Princess Crown Fill-In the Blank Invitation Set INCLUDES 12 Pink and Gold Princess party invitations and 12 premium white envelopes. 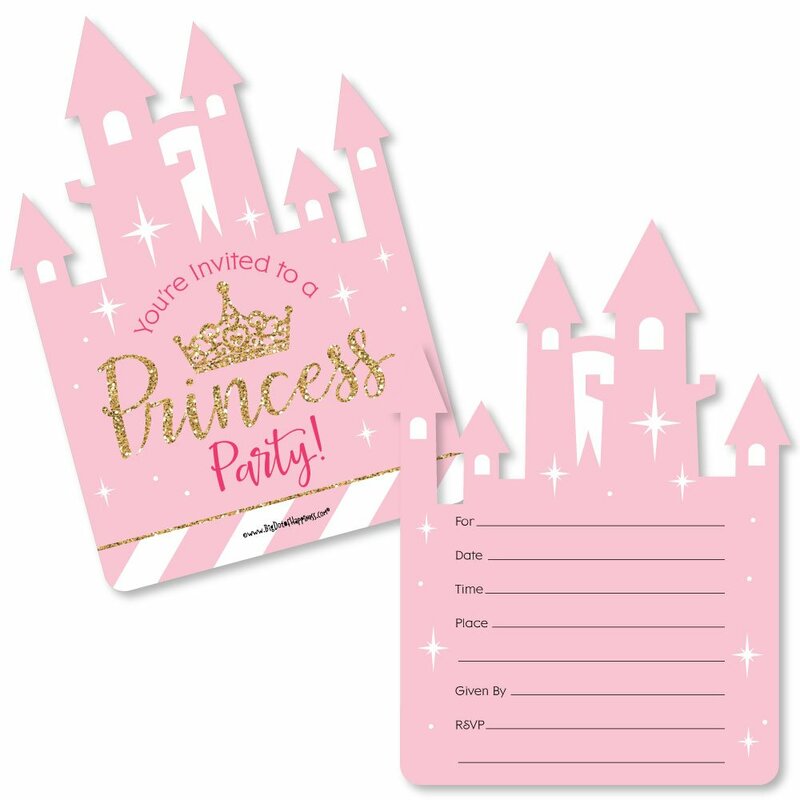 Little Princess Crown fill-in invitations are perfect for any event. 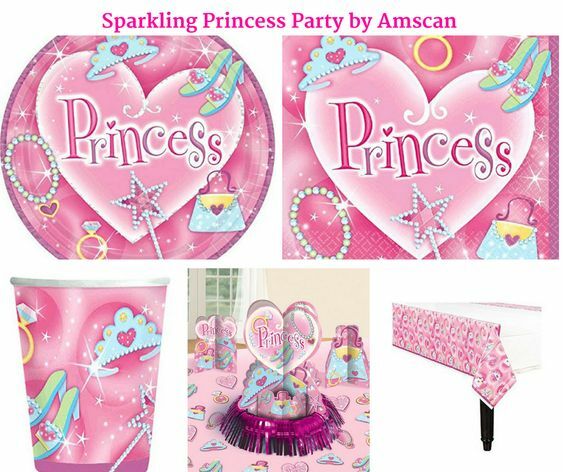 The princess theme is great for a baby shower or birthday party. Pink and Gold Princess party invitations SIZE 5 inches by 7 inches. The included envelopes measure 5 inches by 7 inches. 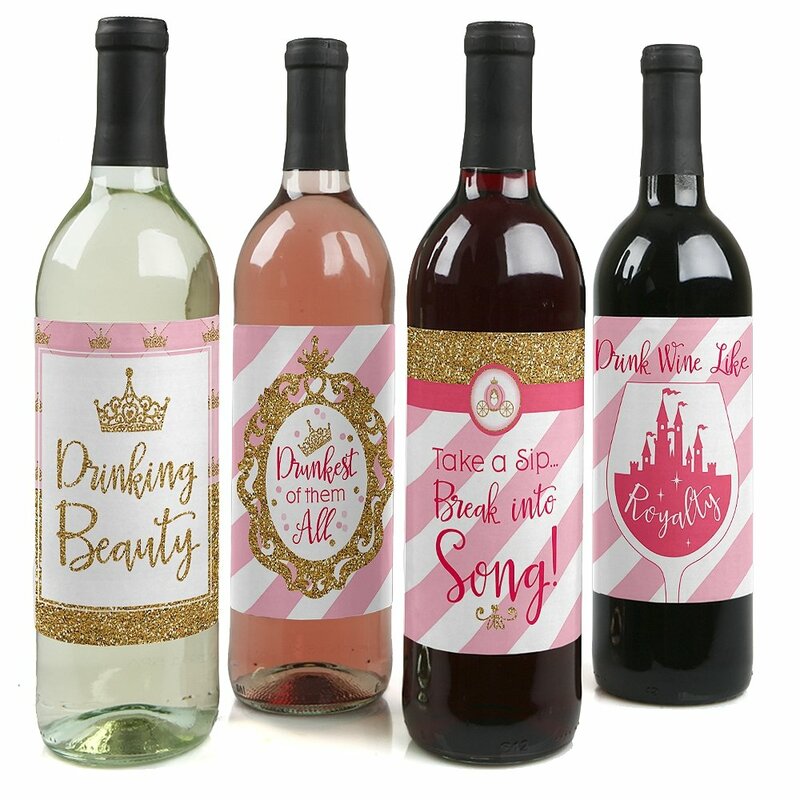 Little Princess Crown Wine Bottle Gift Set INCLUDES Set of 4 pink and gold wine bottle sticker labels in the pretty princess baby shower or birthday party theme. Wine and liquor bottle stickers each SIZE 4 inches wide x 5 inches tall, perfect for standard 750ml bottles. EASY TO USE: Prepare your beverage bottles by ensuring they are room temperature. Removing the original bottle label is not necessary. Carefully peel one adhesive Little Princess Crown Wine Bottle Label from the backing and adhere to a bottle, starting at the edge and rolling to the opposite edge. Press down to smooth. 10-Piece Pink and Gold Princess hanging porch & tree yard decorations INCLUDES 10 Little Princess Crown decorations and 20 yards of monofilament cording – perfect for festive outdoor decor. This outdoor hanging decor are printed on both sides, so they will look amazing anywhere you choose to display them. PERFECT FOR ANY LOCATION! Princess Crown – Pink and Gold Princess – outdoor yard decorations MEASURE 11.5 inches x 7.5 inches (Crown); 10 inches x 10 inches (Castle); 12 inches x 10.25 inches (Carriage). Pink and Gold Princess yard decor can be hung from trees and porches. Set of 10 Princess Crown hanging decorations are also easy party decorations for indoors when hung from ceilings at school, work or home. Everyone will love these baby shower or birthday party supplies. EASY TO USE: Little Princess Crown – outdoor yard decorations are professionally printed and cut with two small holes at the top. Easily use the included 20 yd. monofilament cord to display your princess baby shower or birthday party hanging decor at a variety of locations, indoors and outside. 20-Piece Baby Shower or Birthday Party Photo Booth Props Kit INCLUDES 20 Little Princess Crown photo booth props, 20 wooden dowel sticks and adhesives for assembly. EASY ASSEMBLY: Simply attach the printed DIY photo booth props to the wooden dowels with included adhesive and reinforcing stickers. 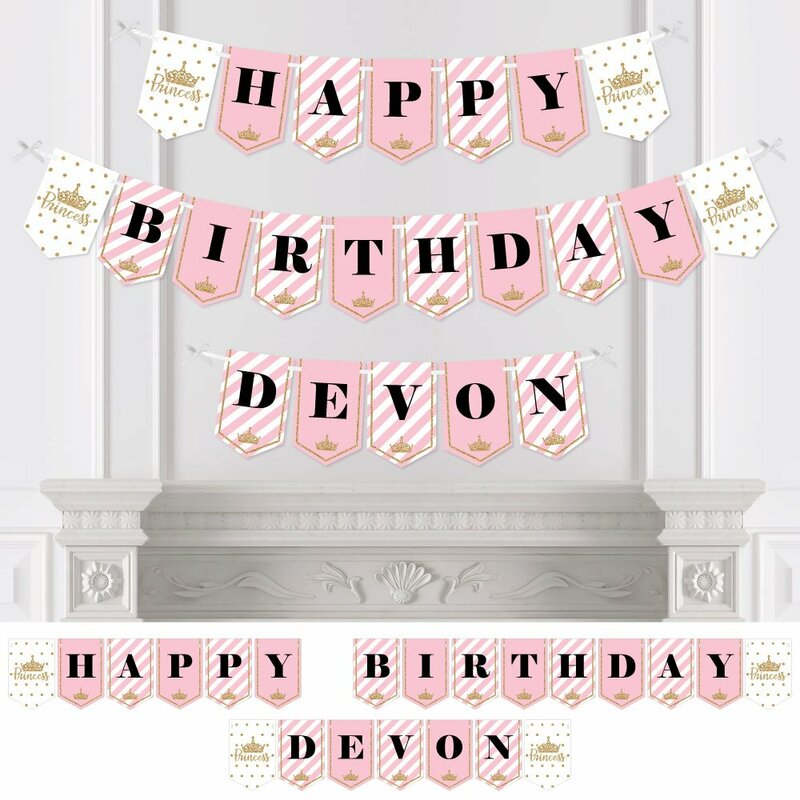 Custom Little Princess Crown Personalized Birthday Party Bunting Banner is an impressive party decoration for your pink and gold princess party theme celebration. Your party guests will love seeing your special message printed on this fun personalized party banner. Little Princess Crown Personalized Bunting Banners SIZE: Each pennant measures 8.5 inches high x 5.5 inches wide. Ribbon measures 24 feet long and 3/8 inch wide. 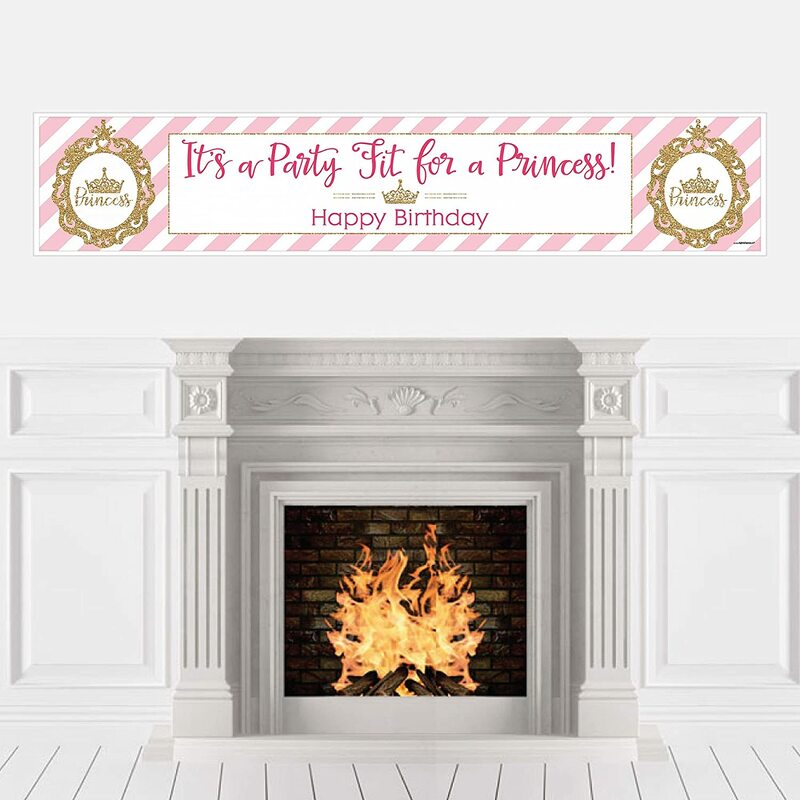 PERSONALIZED PARTY SUPPLIES: Little Princess Crown birthday party banners feature your custom text. Simply click “Customize Now” to add your personalized message to this stylish party banner. BIRTHDAY PARTY DECORATIONS: A Little Princess Crown Birthday Party Bunting Banner is perfectly personalized, making it an easy way to decorate for your birthday party and bring your pink and gold princess theme to life. Hang at the entrance of your party, over the food table or candy buffet, at the gift table or behind the head table. Custom Little Princess Crown are a great way to welcome all your birthday party guests as they arrive. Little Princess Crown DIY Wrappers INCLUDES 15 Pink and Gold Princess party wrappers and 20 clear stickers. 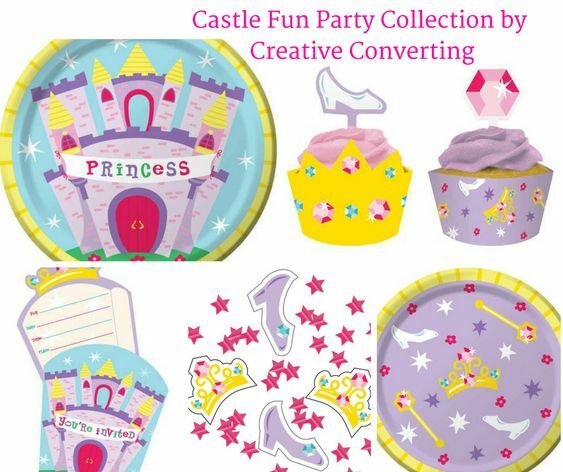 Little Princess Crown DIY party supplies are perfect for a baby shower, birthday party. Little Princess Crown do it yourself favor wrappers SIZE is 11.3 inches long and 1.75 inches wide, with a 2.5 inches tall center. Folded, they can accommodate favors and decorations 4.5 inches at the largest size and 3.5 inches at the smallest, and items with a circumference from 7 inches to 11 inches. EASY PARTY DECORATIONS: Little Princess Crown DIY Baby Shower or Birthday Party Wrapper Favors make it easy to style a coordinated event. Wrap candy bars, treat containers and snack bags in these fun favor wraps. They also make adorable Little Princess Crown table decorations when you wrap apothecary jars at your candy buffet and centerpiece containers. 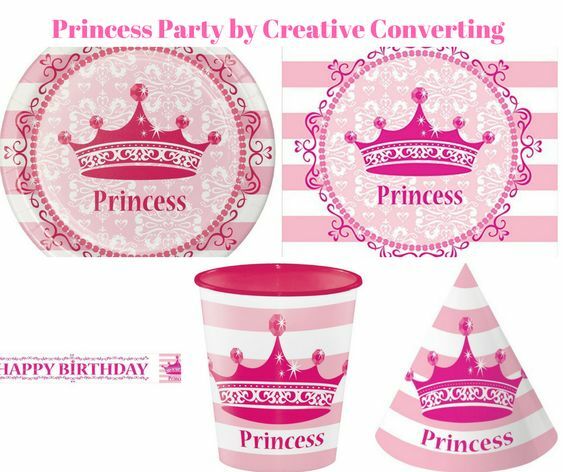 Or, use them at beverage labels and napkin rings for easy party decorations in the Little Princess Crown theme! Little Princess Crown DIY Tags INCLUDES 20 die cut favor gift tags in the Little Princess Crown theme. 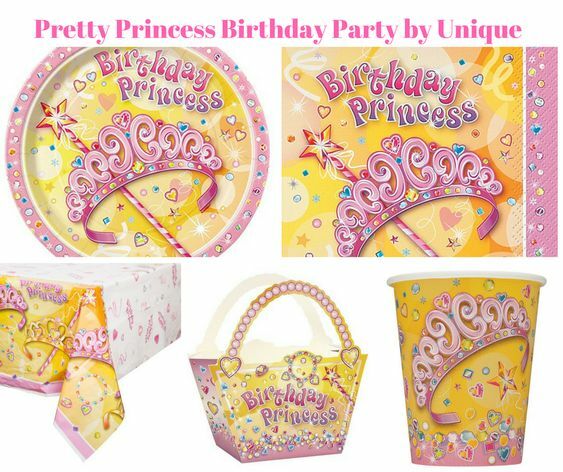 Princess castle DIY party supplies are perfect for a pink and gold princess baby shower or birthday party. Little Princess Crown do it yourself tags MEASURE 2.5 inches in diameter and will quickly add a personal touch to all your baby shower or birthday party favors. Each tag will arrive ready to use with a hole punch at the top. Little Princess Crown Smash Cake Kit INCLUDES 1 Little Princess Crown bunting banner with gold castles and O-N-E shaped letter pennants, 1 I AM ONE first birthday party hat, number 1 photo prop and number 1 candle. Little Princess Crown smash cake kit is an adorable addition to your 1st birthday party photos. 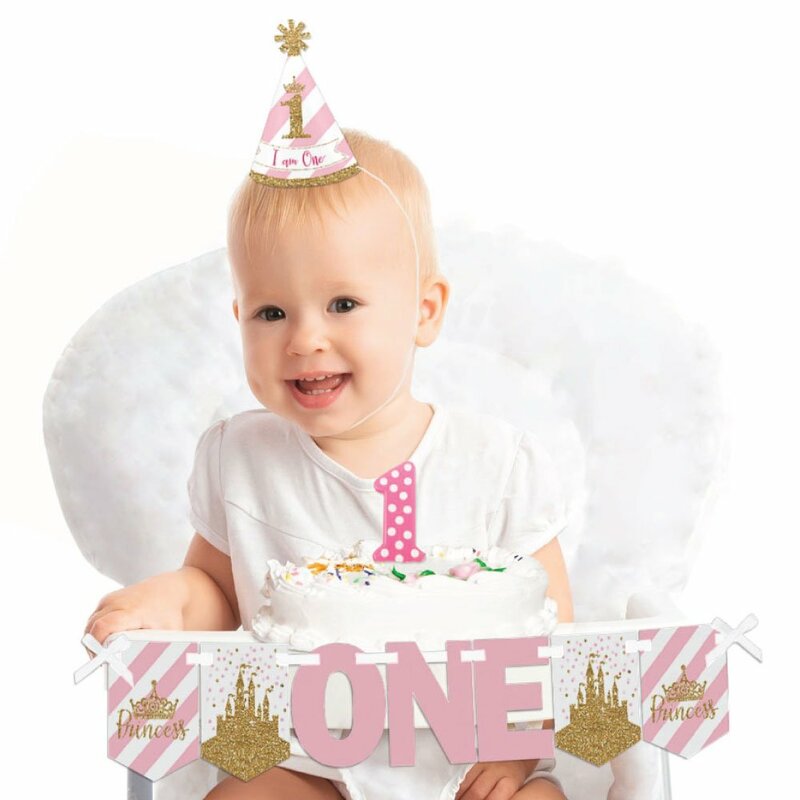 FIRST BIRTHDAY DECORATIONS: The Little Princess Crown bunting banner is perfect for your first birthday photo shoot and then doubles as an adorable high chair decoration at the birthday party. The princess themed pennant flags and shaped O-N-E cut out pennants easily string onto the included 68” of satin ribbon. Pennant flags are professionally printed on sturdy cardstock paper and will arrive cut, ready to assemble. Pink and Gold Princess Lawn Decorations INCLUDES 8 coordinating Little Princess Crown yard decorations: 1 Large Once Upon A Time Castle, 3 Carriages, 4 Princess Tiaras; and 16 metal stakes for displaying. Easy assembly instructions are also included. PERFECT FOR ANY LOCATION! Little Princess Crown Yard Signs SIZE Large Once Upon A Time Castle 19.75″ x 15.25″; Carriages 12″ x 10.25”; Princess Tiaras 12” x 9”. 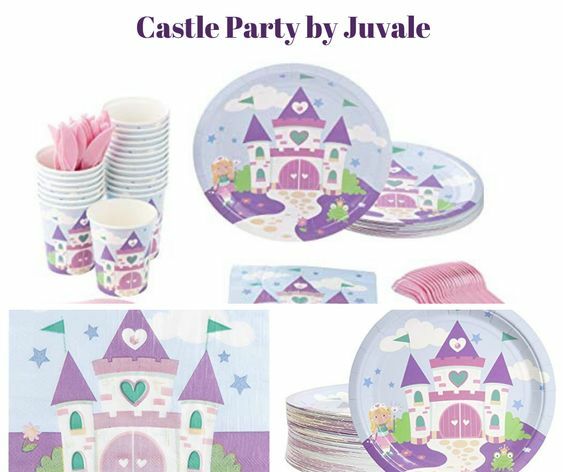 Princess Castle yard decor is an easy way to decorate your home or business for baby shower or birthday party. 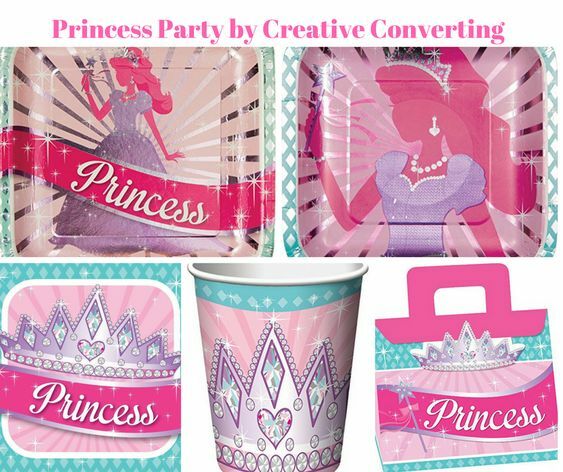 Both adults and kids will love these Little Princess Crown party supplies. EASY TO USE: Little Princess Crown – Yard Sign & Outdoor Lawn Decorations are professionally printed and cut, making assembly quick and easy. Simply insert two heavy-duty metal stakes into each royal princess yard ornament and press into the ground to display. Outdoor Tiara, Castle & Carriage Lawn Decorations INCLUDES 10 coordinating Little Princess Crown yard decorations: 3 Carriage shapes; 3 Castle shapes; 4 Princess shapes; and 20 sturdy metal stakes for displaying. PERFECT FOR ANY LOCATION! 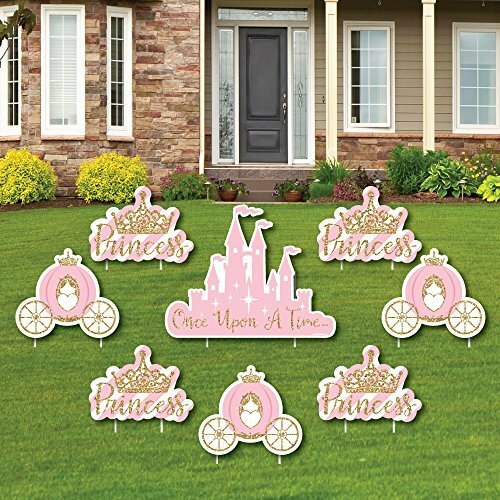 Little Princess Crown Yard Signs SIZE Carriage 12 inches x 10.25 inches; Castle 10 inches x 10 inches; Princess 12 inches x 9 inches. Vibrant pink and gold yard decor is an easy way to decorate to be baby shower or birthday party. 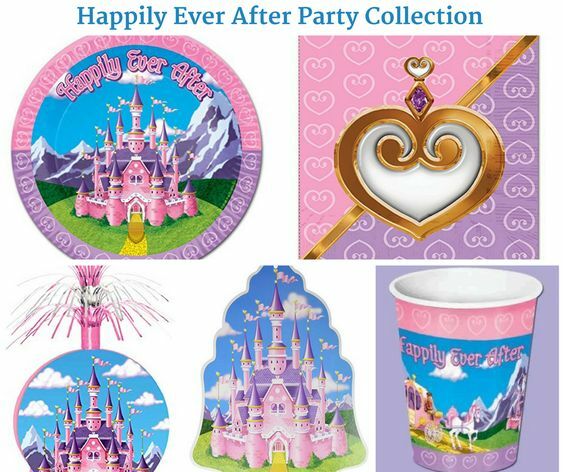 Both adults and kids will love these tiara, castle & carriage party supplies. Display in front yards of your home or party venue.